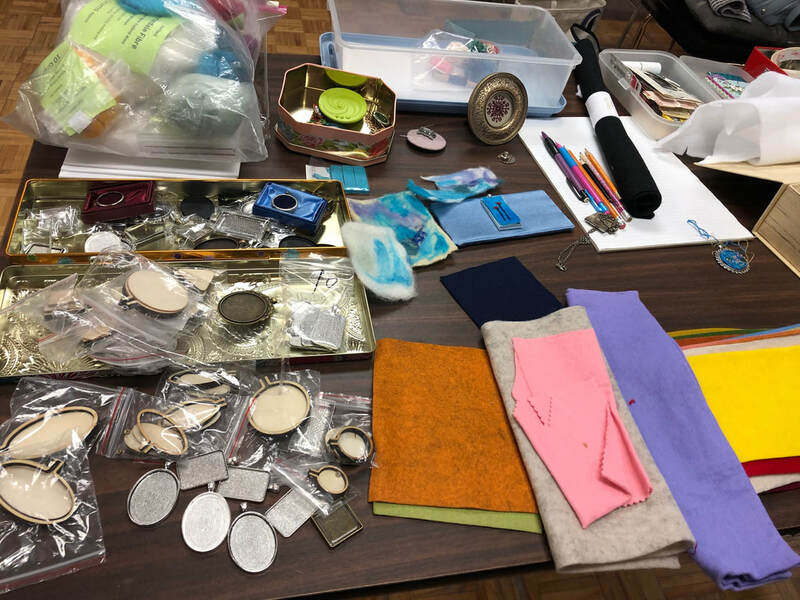 At the April meeting Geri directed a make-and-take workshop on making magnetic needle minders from button blanks and rare earth magnets. 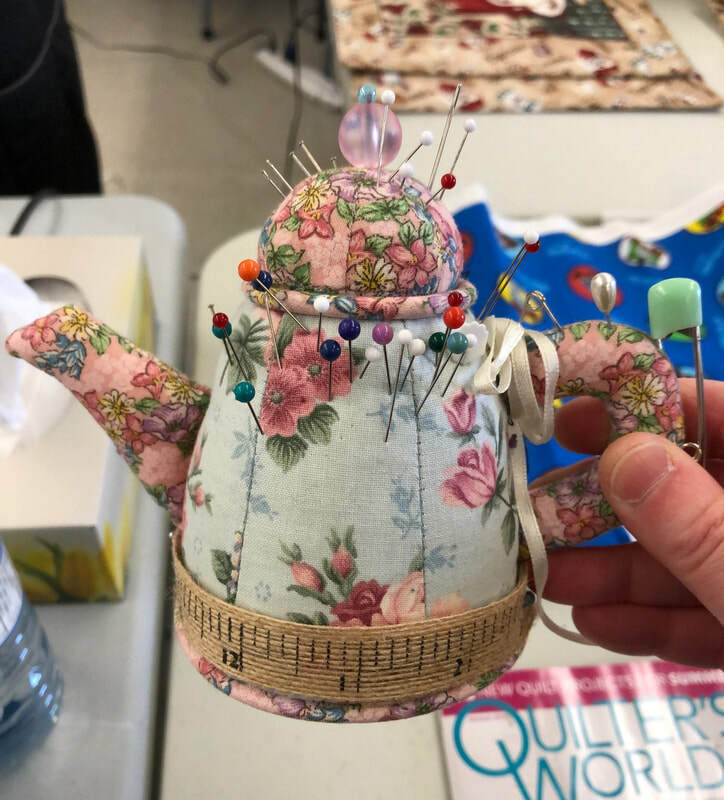 Most folks brought fabric scraps to make their own. 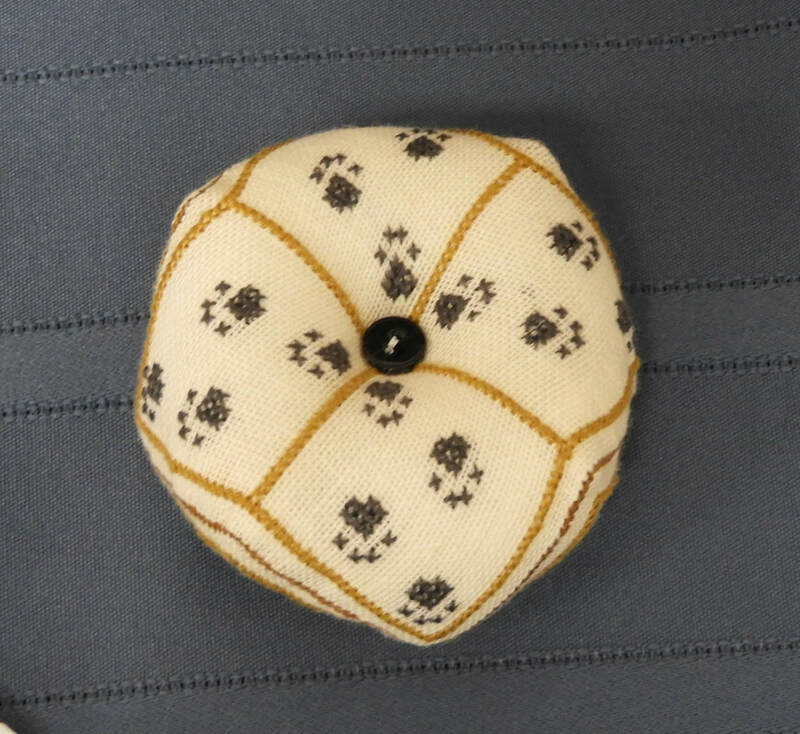 Teeny weeny bits of stitching will also work. 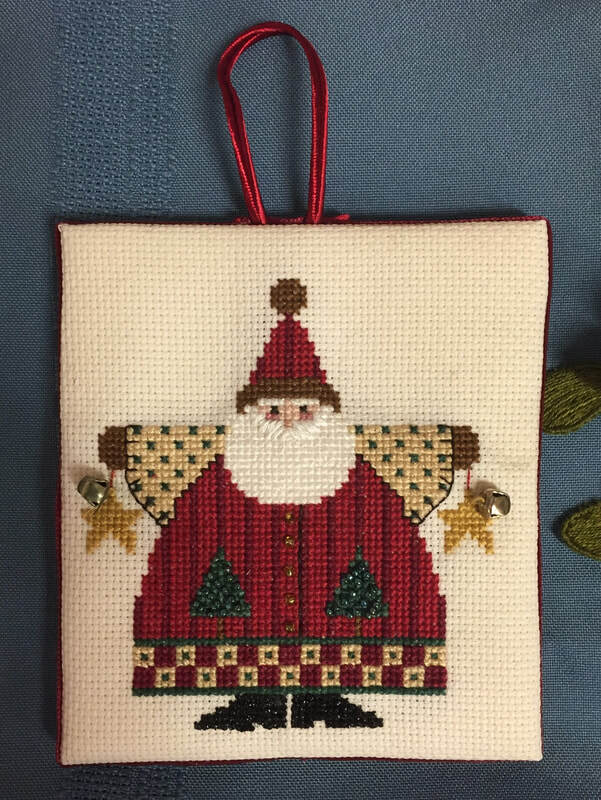 It was a fun, quick, and easy activity. 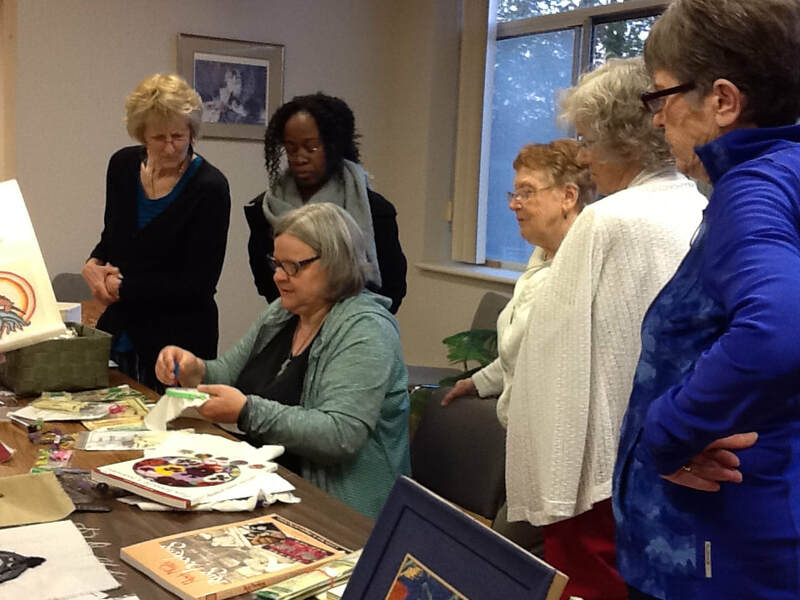 Geri first explained the process then put the participants to work. 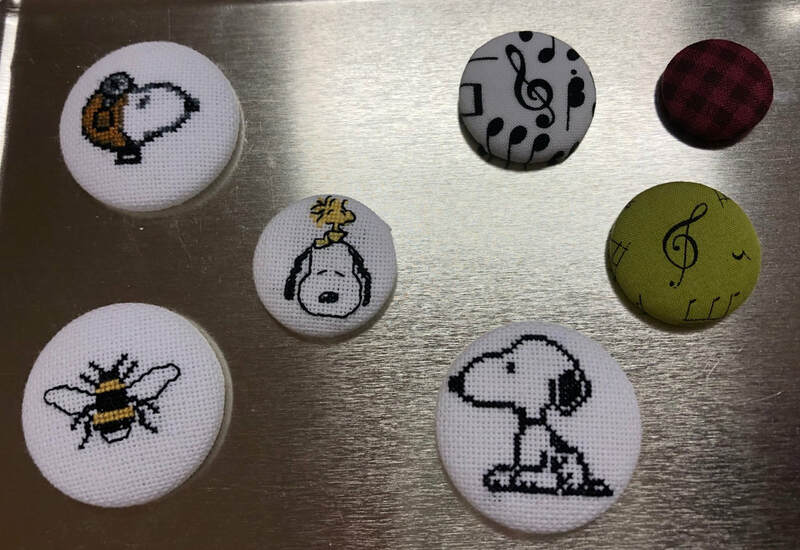 Needle minders can be made from many things: small pieces of stitchery, fussy cut fabrics, costume jewelry, Lego, orphan earrings, etc. 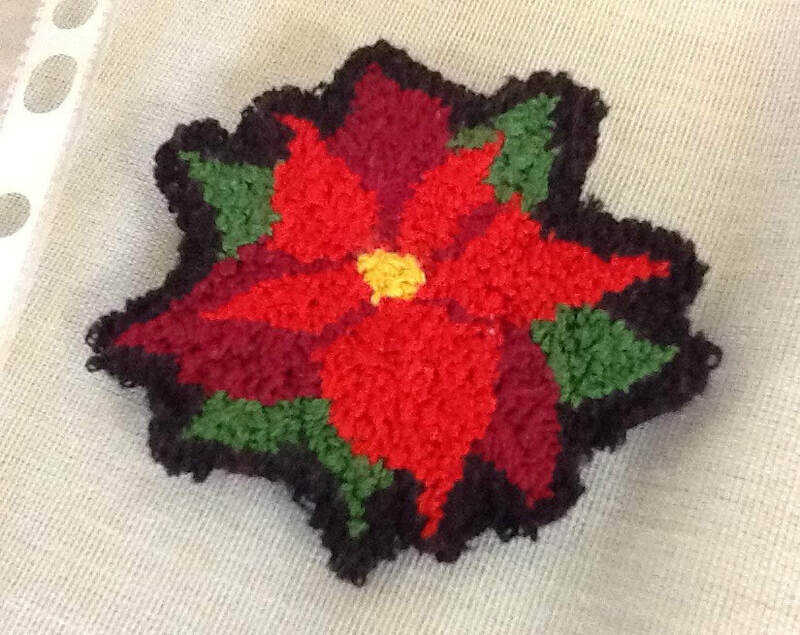 Kim's guest, Doris Kidd, spoke to us about a piece of embroidery - Victorian ladies in a garden using 50 colours of silk thread. She had started it as a child in England about the time WWII was declared in 1939. 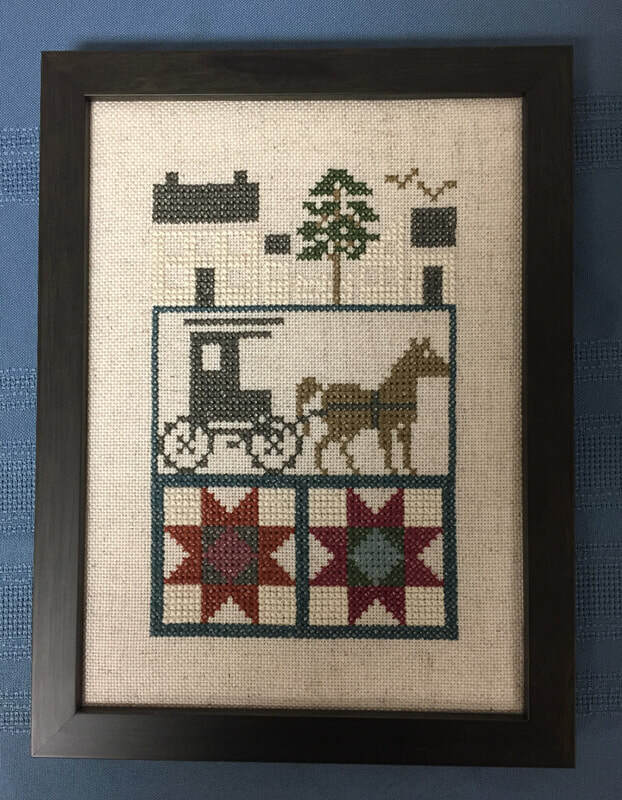 It got put away and decades later re-discovered and two of the elements were finished and then framed as gifts for her two daughters. 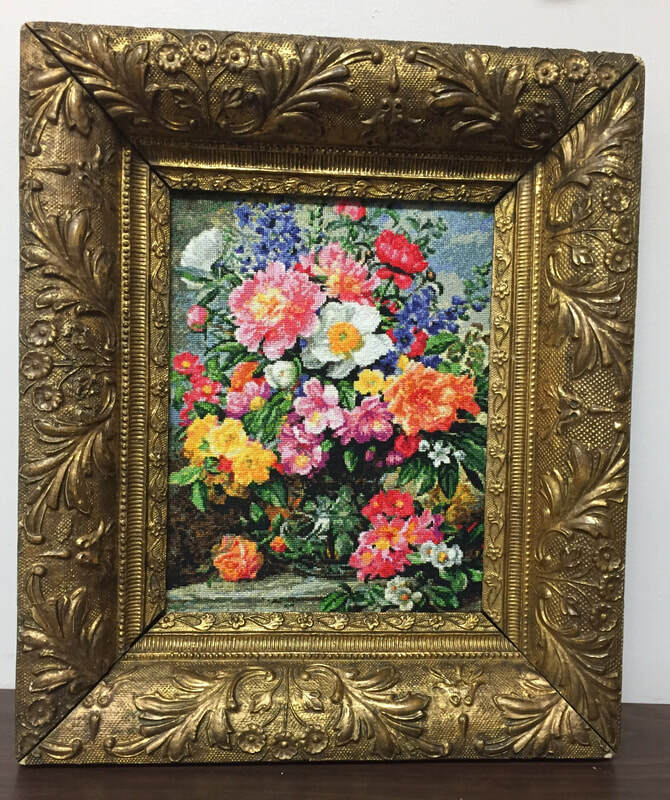 She read to us the story of how this piece arrived at our meeting 70 years after its inception. 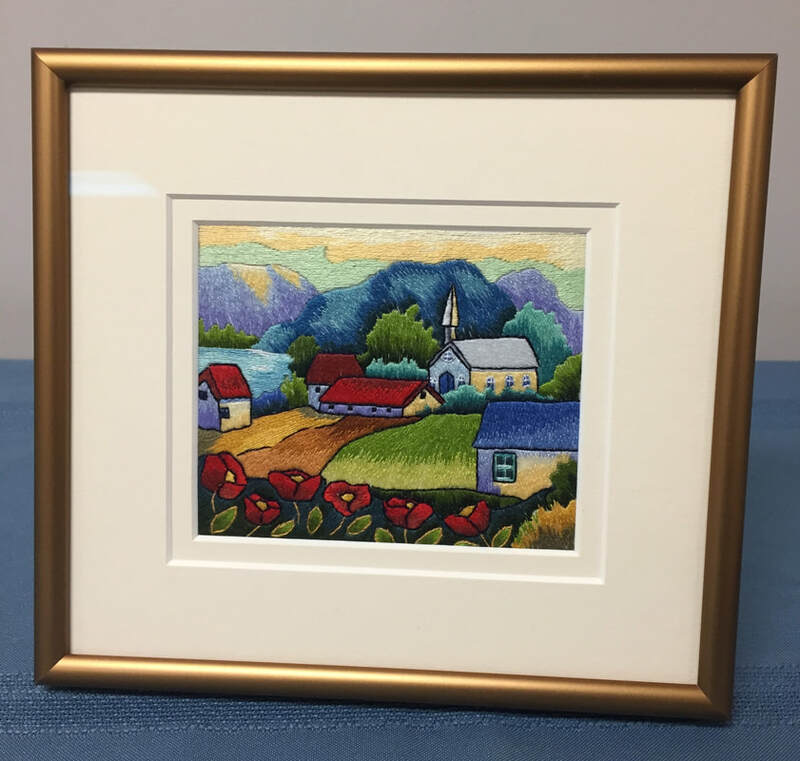 Jeanette displayed her thread painting that was designed by Trillium member, Carol Arsenault. 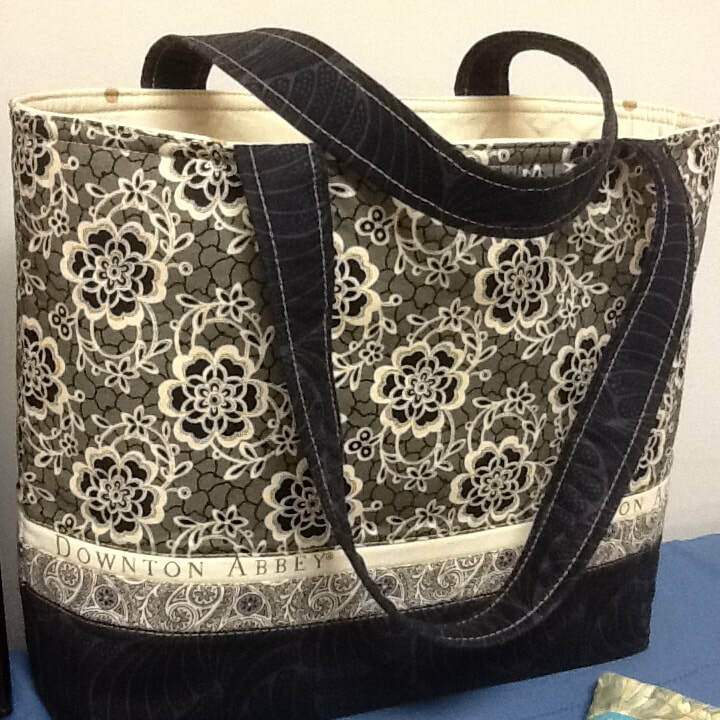 Jeanette also showed us a tote bag onto which she had attached a canvaswork piece she had designed and stitched. 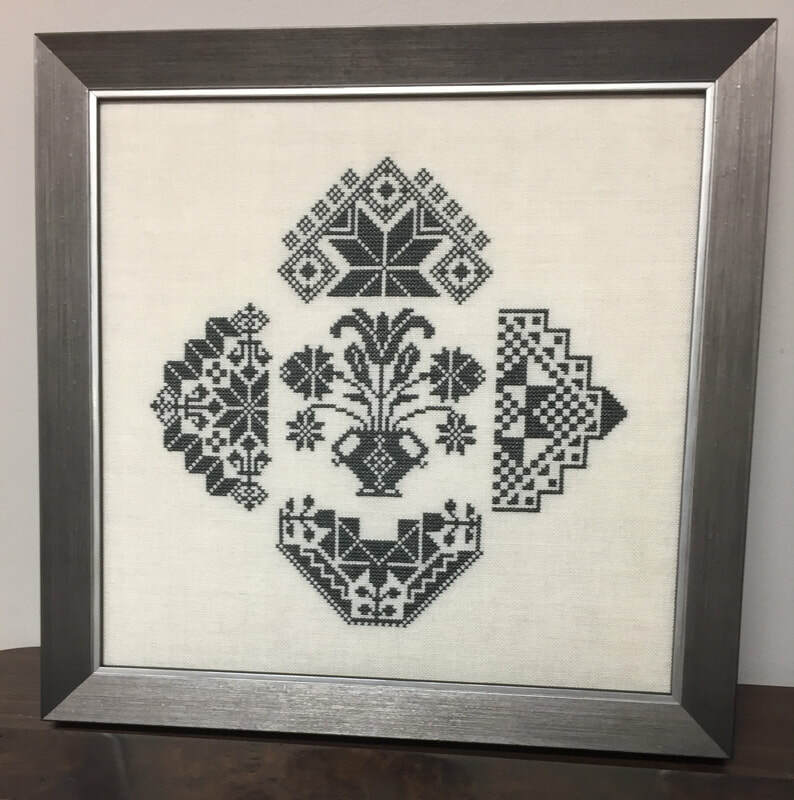 Marion showed off her Hardanger piece that was designed by Toronto guild member and designer, Judy Chen. 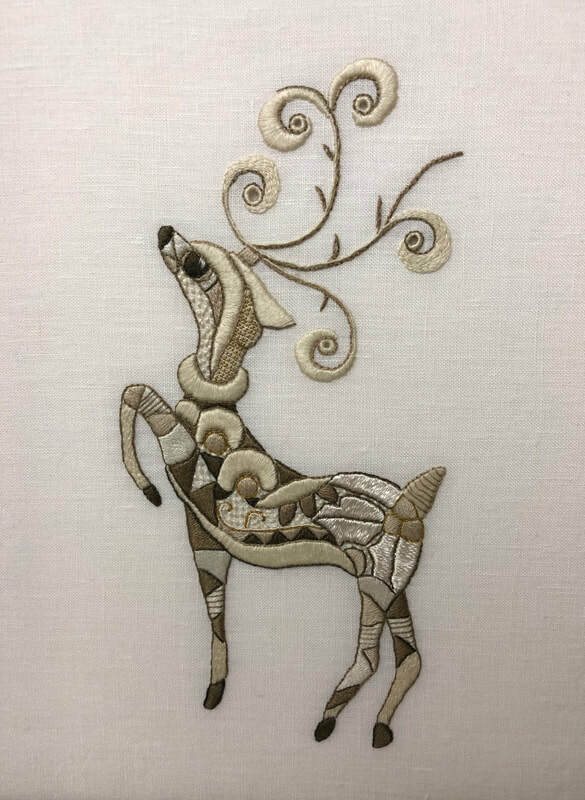 Marion also brought in a Trish Burr whitework design of a reindeer. 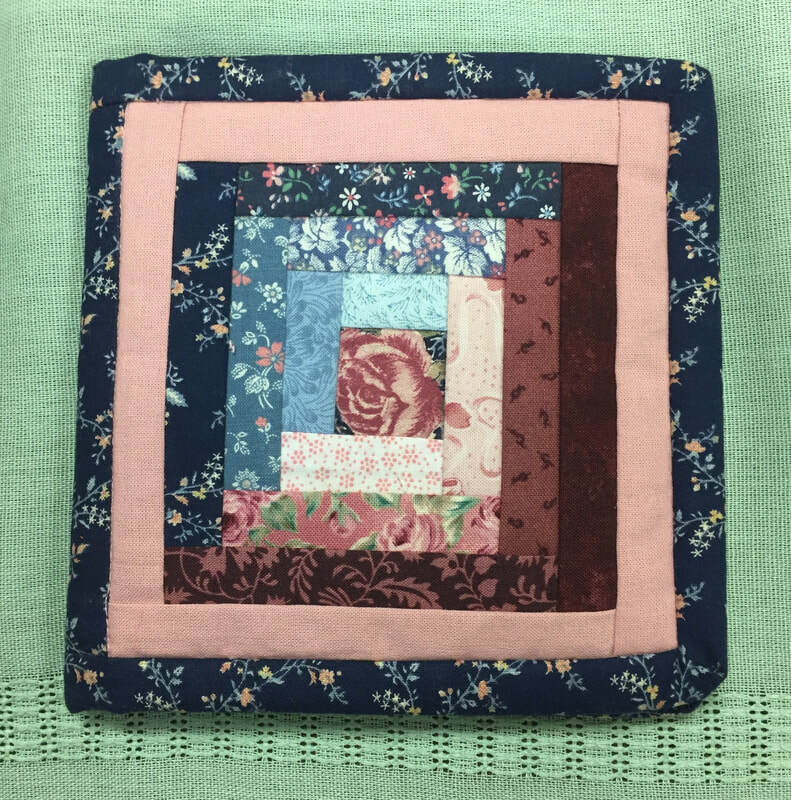 She modified the pattern using different shades of taupe. 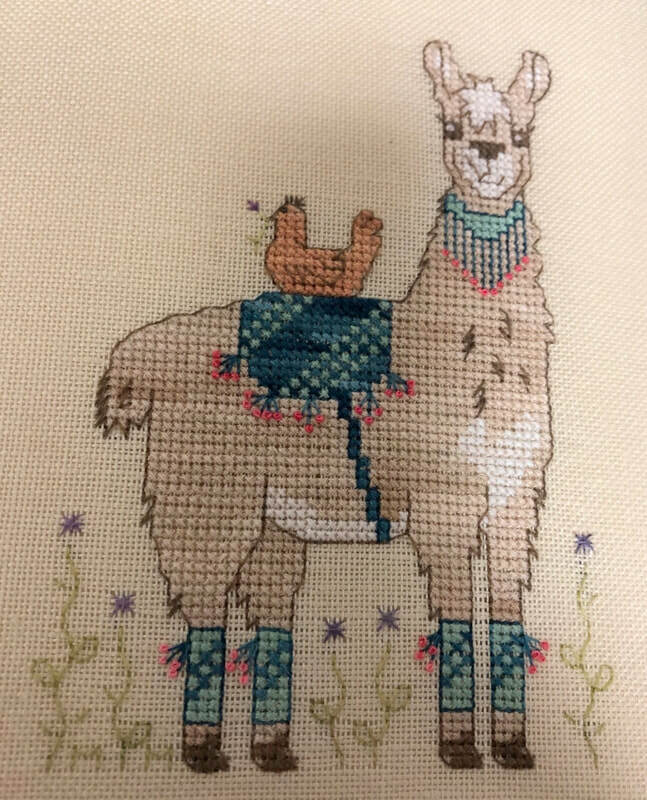 Meagan showed us her "Hen and her llama" piece. 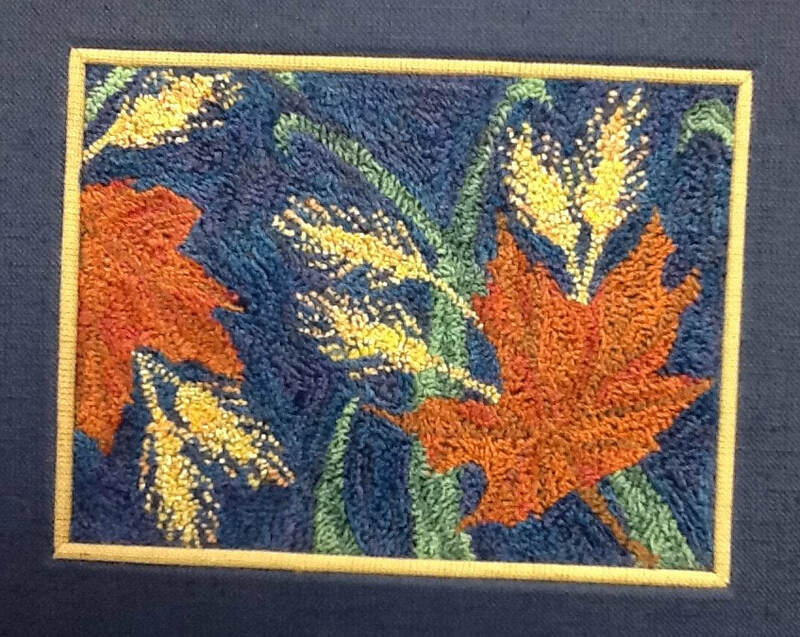 Meagan also shared this sampler with variegated thread and hand painted fabric. 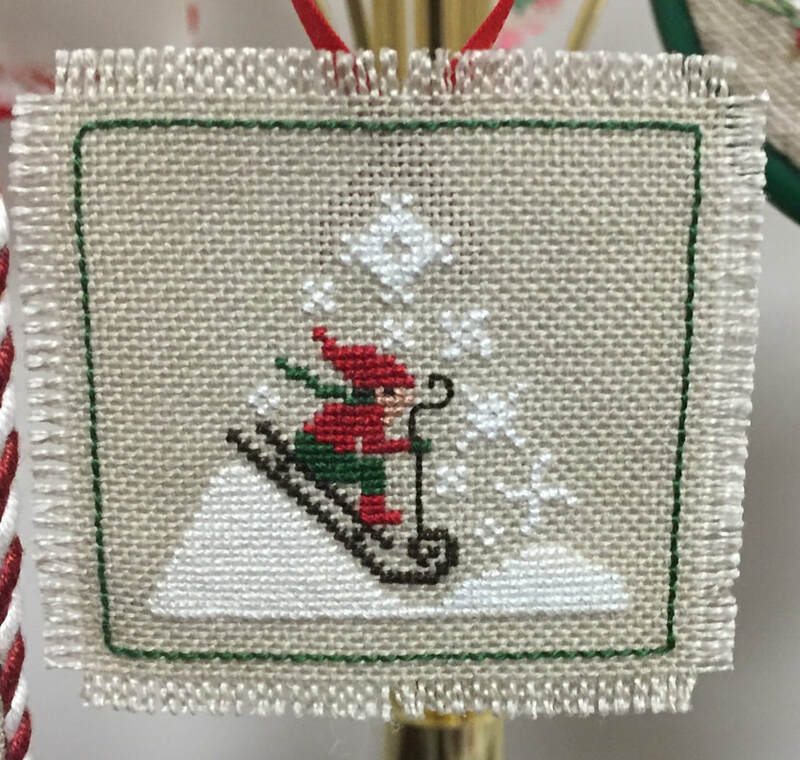 Sylvia showed off her completed miniature from last month's program. 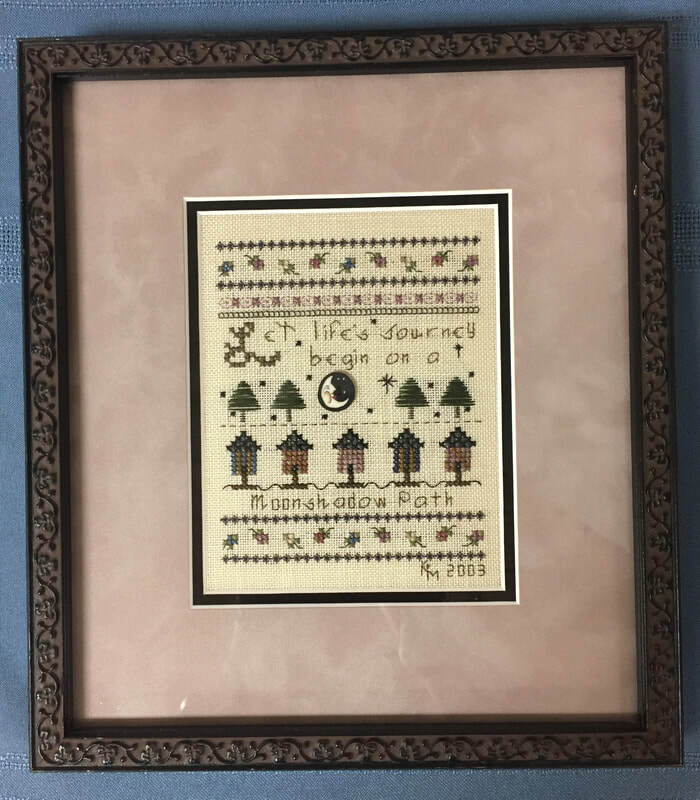 Sylvia also brought in a piece of stitchery featuring 'windows' which had been a themed piece from another guild to which she belongs. 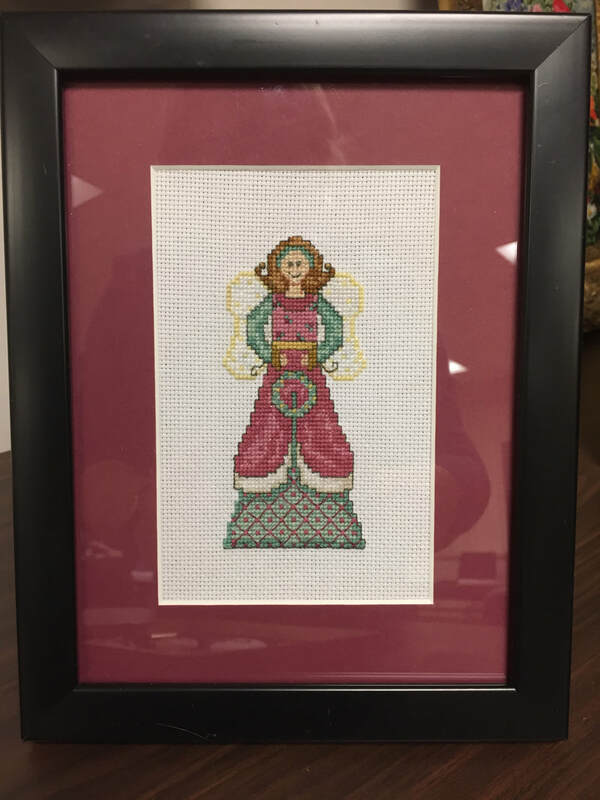 It was a gift for her granddaughter. 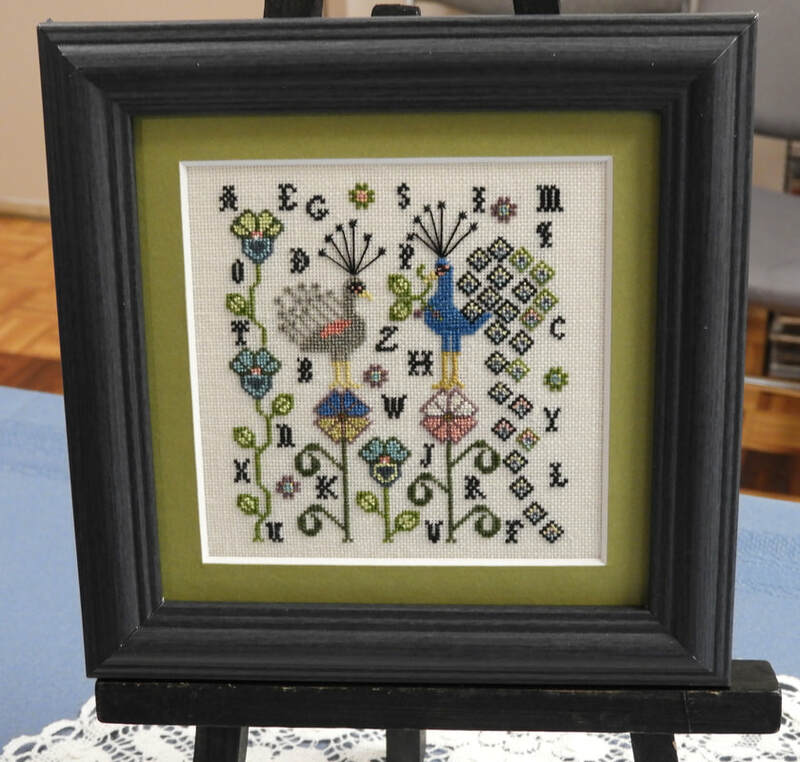 This was Jeanette's finished whitework piece that she started last summer at the EAC Seminar in PEI. 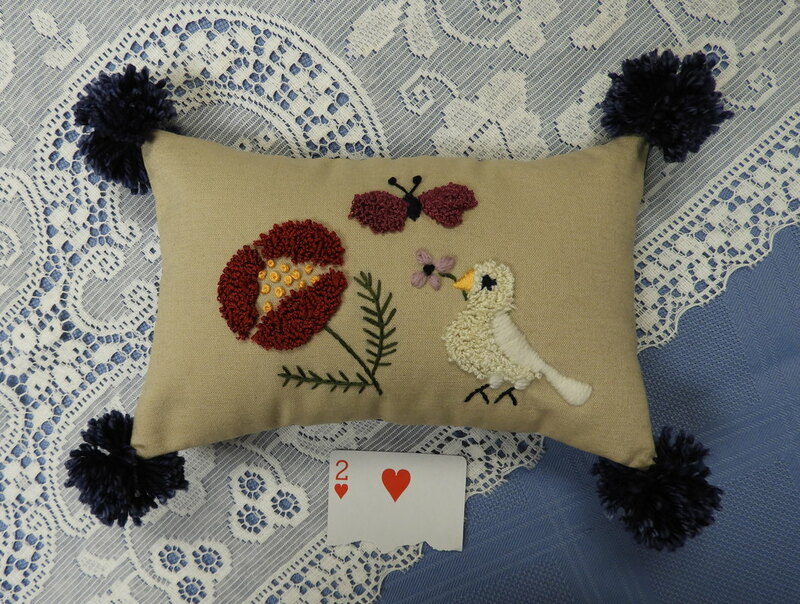 It is a design by Jenny Aidin-Christie. 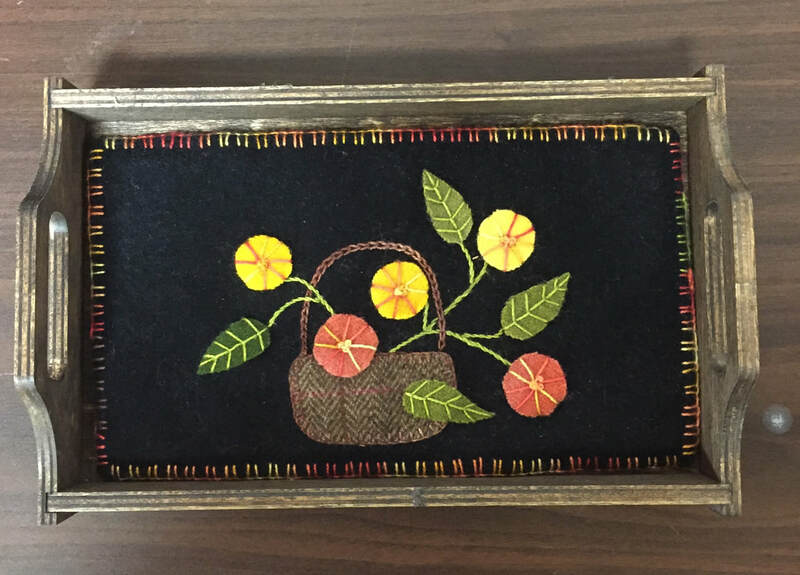 Sharon's stitchery was mounted into a box that was custom made by her friend, John. 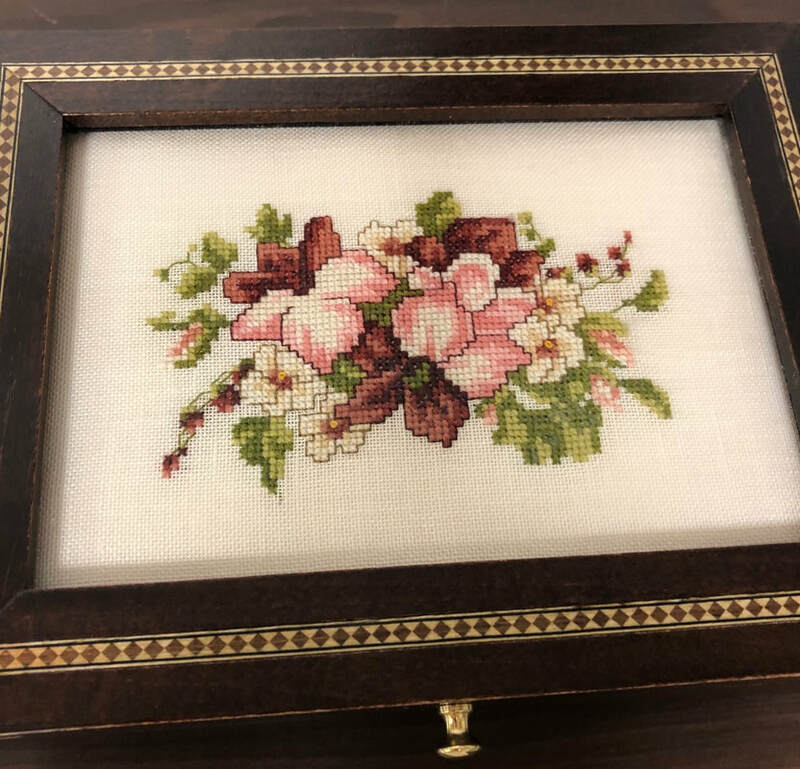 Shelley's daughter, Gillian, stitched this piece as a wedding gift for friends. 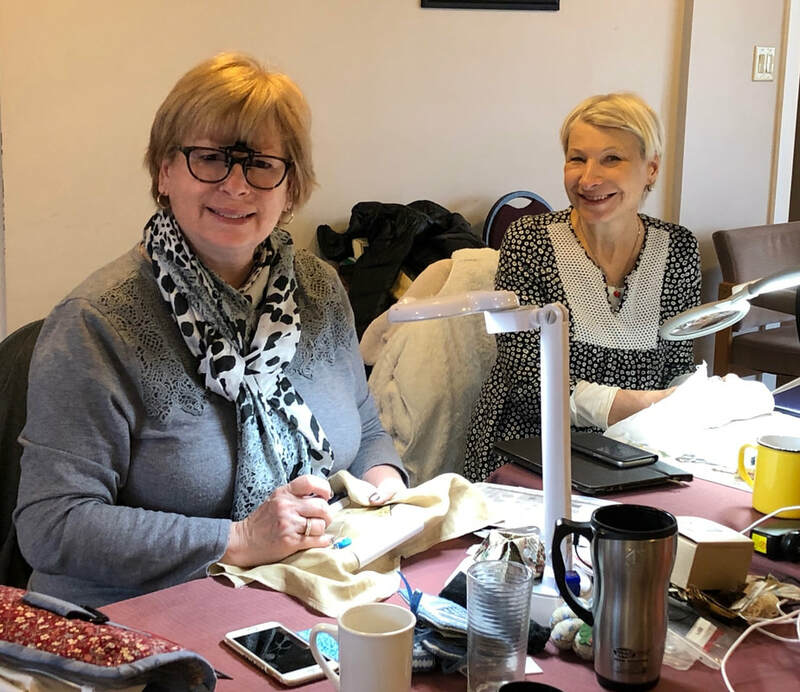 Our spring stitching retreat at Elim Lodge was a great success! 7 of us went up on Thursday and the rest arrived on Friday. A couple of people joined us just for the day. 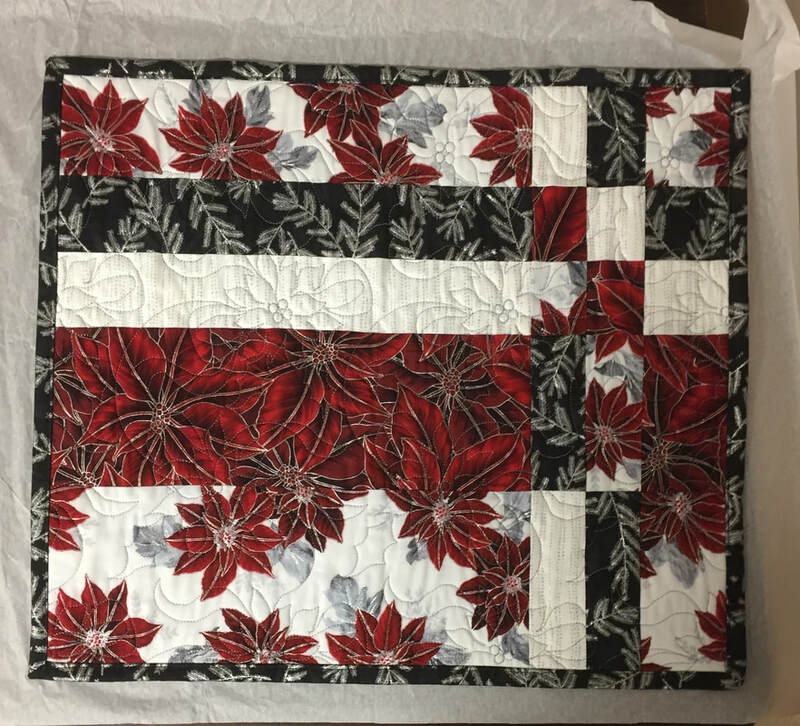 Yvonne admired Poppy's Kathy Wylie quilt pattern book. 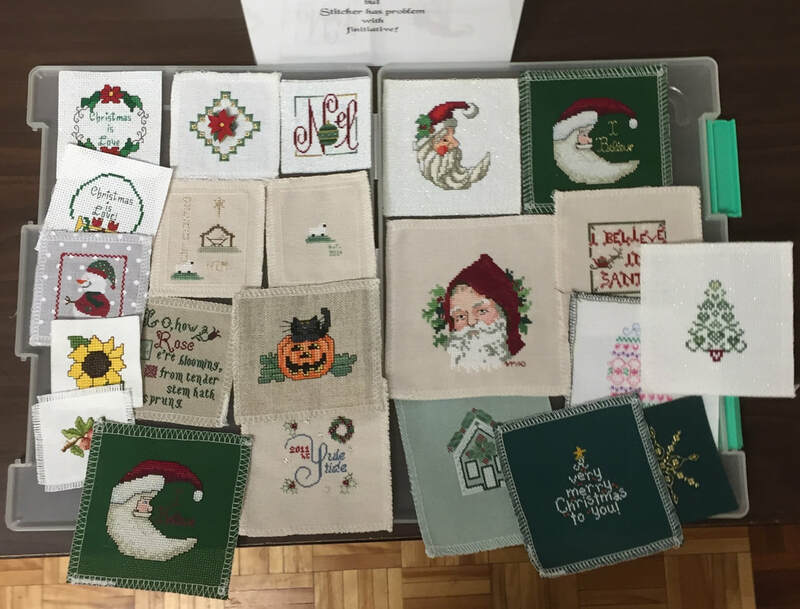 Geri and Poppy got a lot of stitching done. They sit around tables and spread out projects, lamps, snacks, etc. 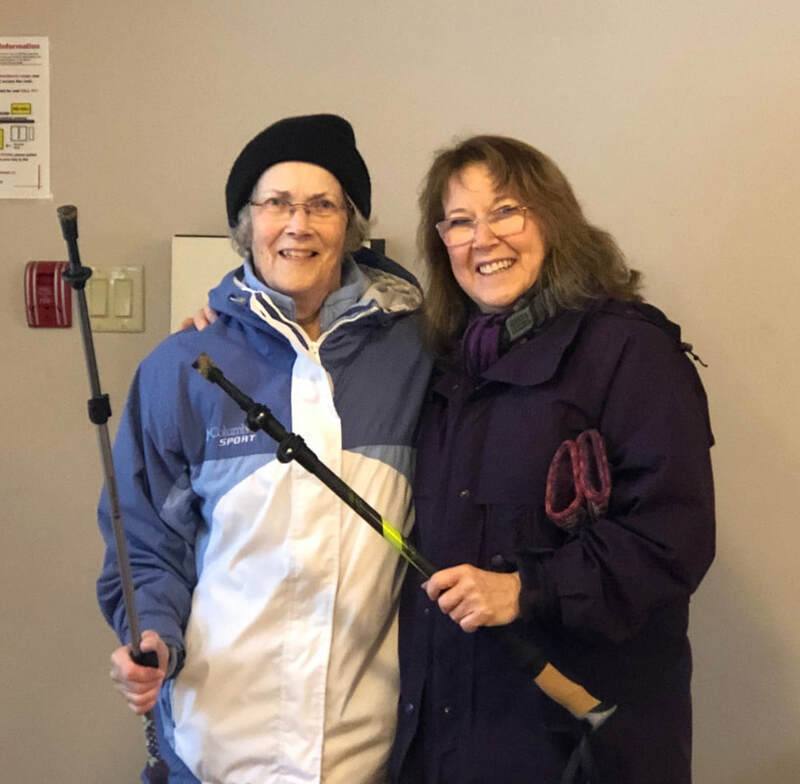 Sylvia and Barb brought their walking poles and met for an early morning walk. 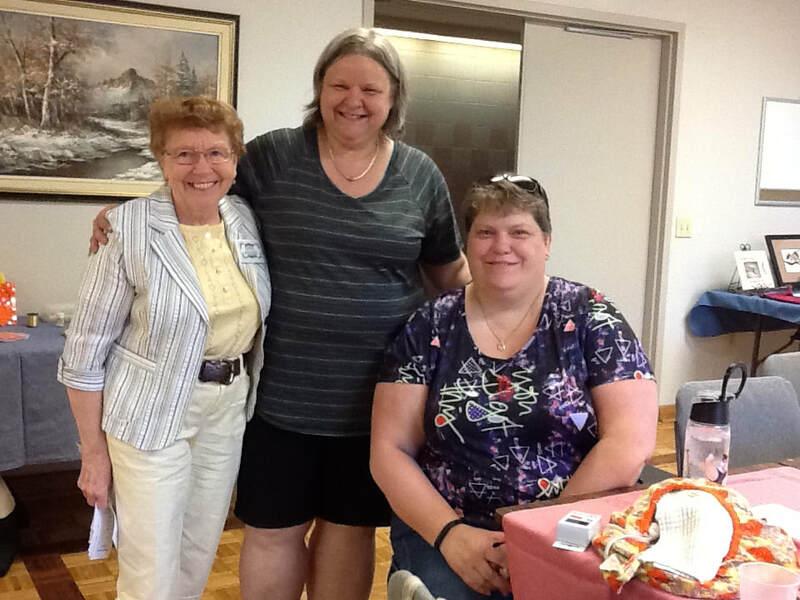 Two quilting groups were also at the camp the same weekend. 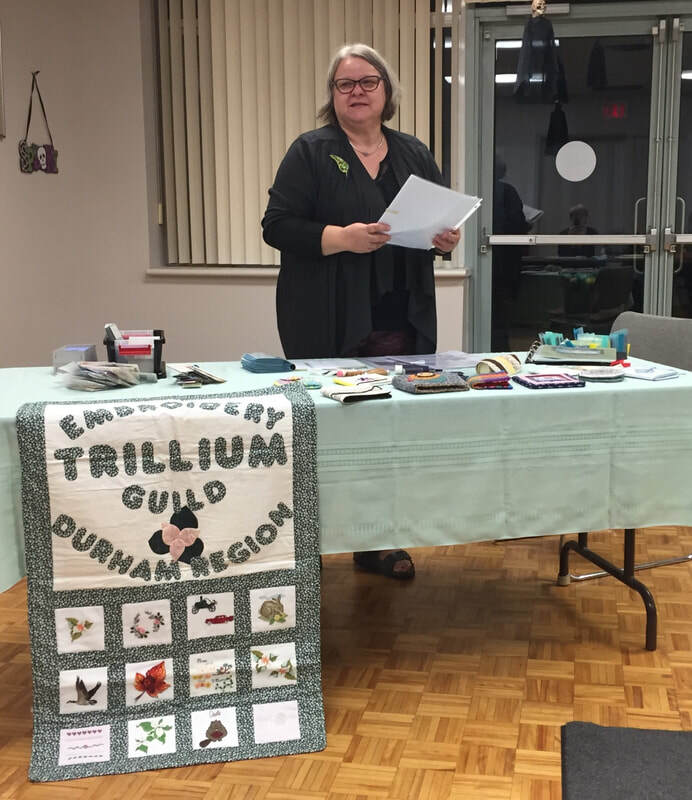 Trillium member like to 'spy' on other groups and see what they're creating. 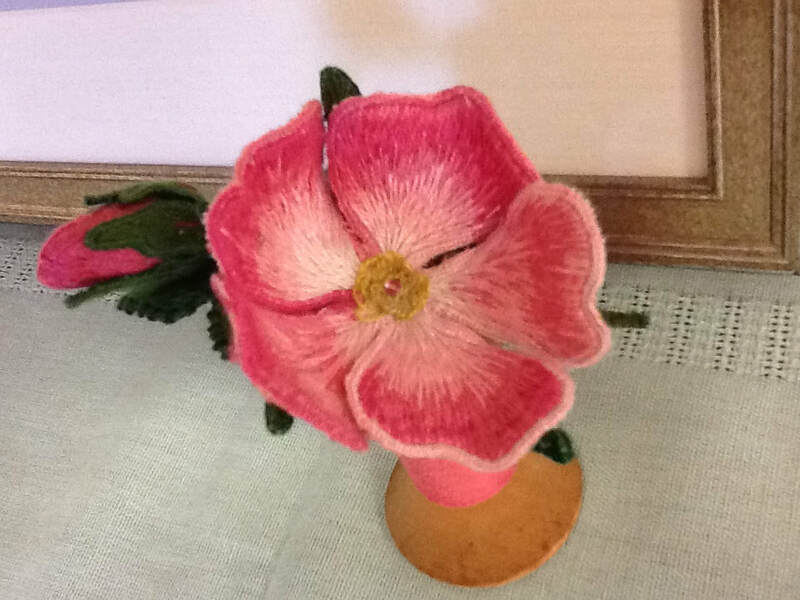 This group had a wool felt appliqué class. 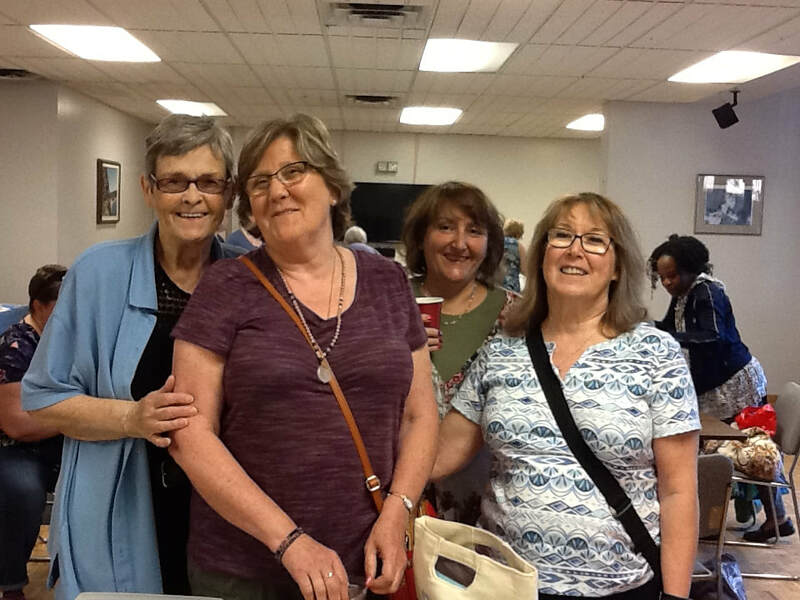 The larger quilting group occupied the big recreation hall. 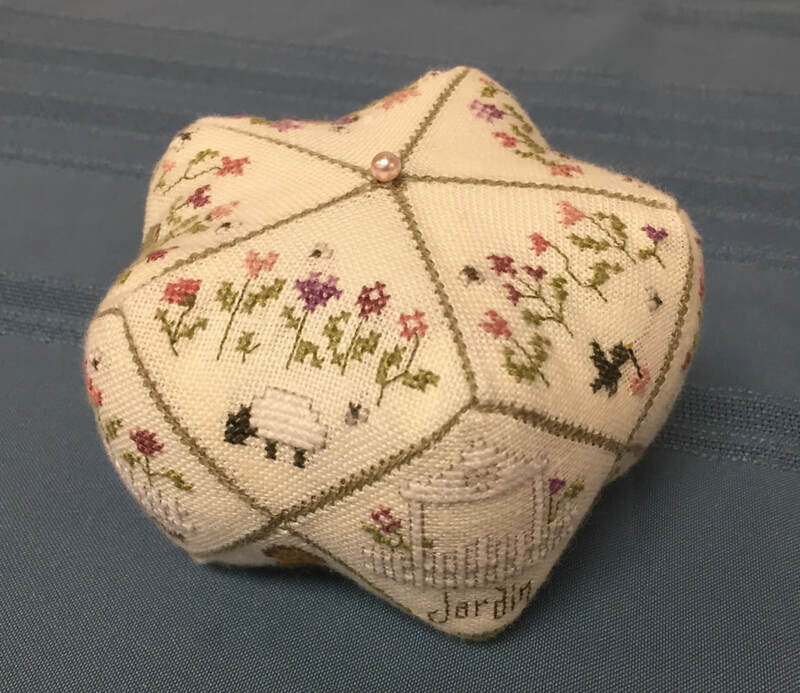 One quilter had this adorable pincushion which contained a tape measure under the lid. Our February meeting was cancelled due to poor weather. 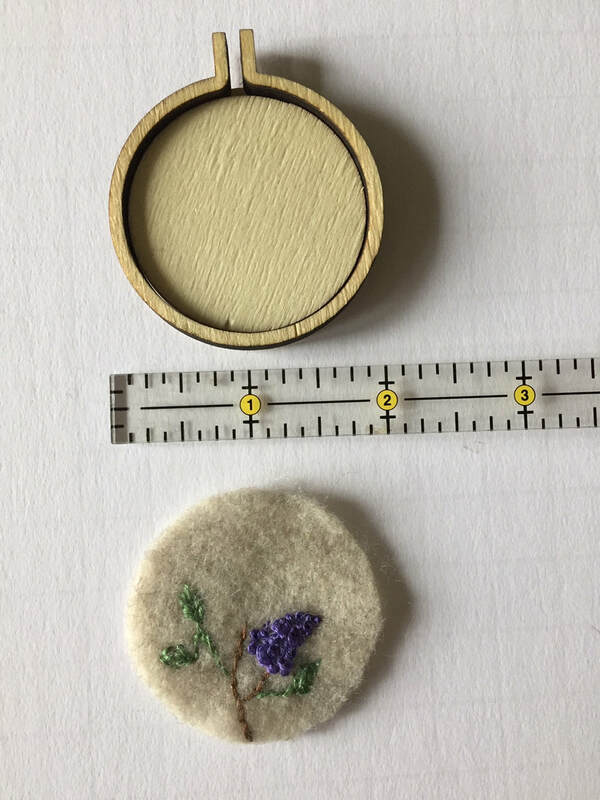 For March, Jeanette directed us as we created miniature embroidered pieces which could be mounted into wee pendants, pins, or frames. 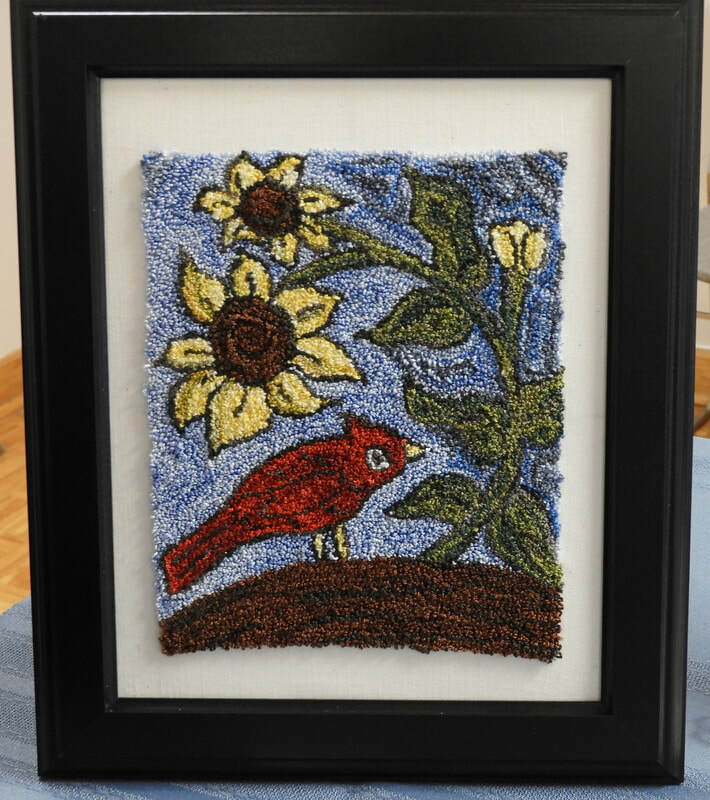 Alda's granddaughter entered her first cross-stitched piece into a school competition and won first place. 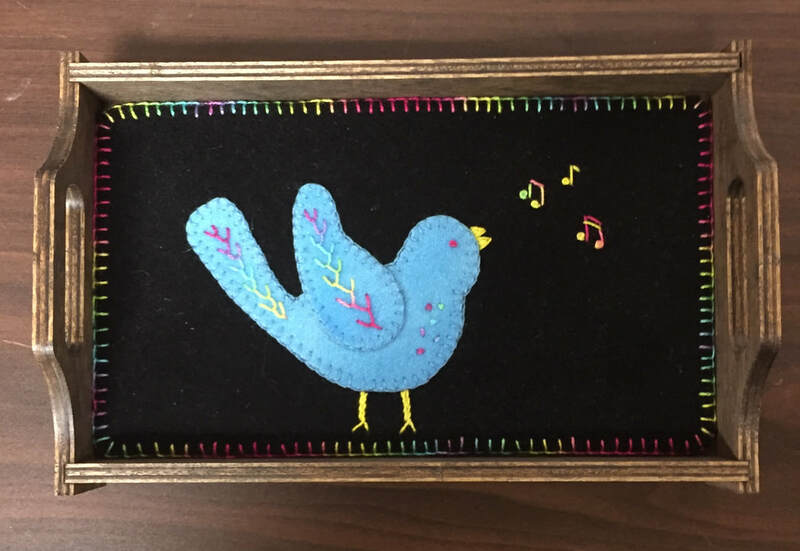 She had a little help with the two French knots for the eyes and three little back stitches for the mouth. 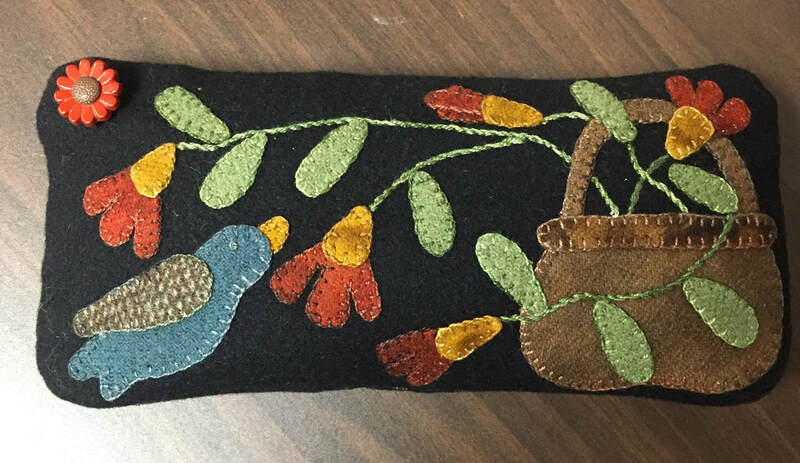 Jeanette brought in a two-sided piece that was embroidered onto 5 layers of stiffened felt. 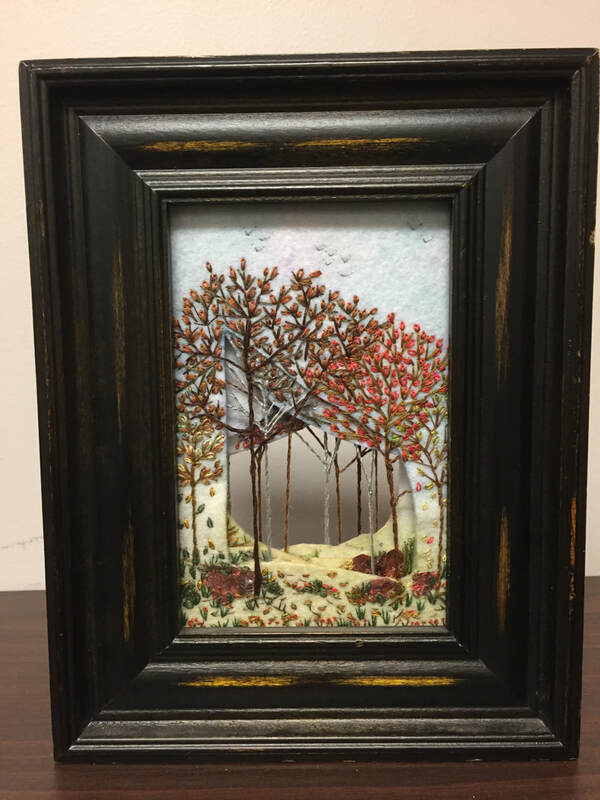 It depicts trees in various seasonal stages. 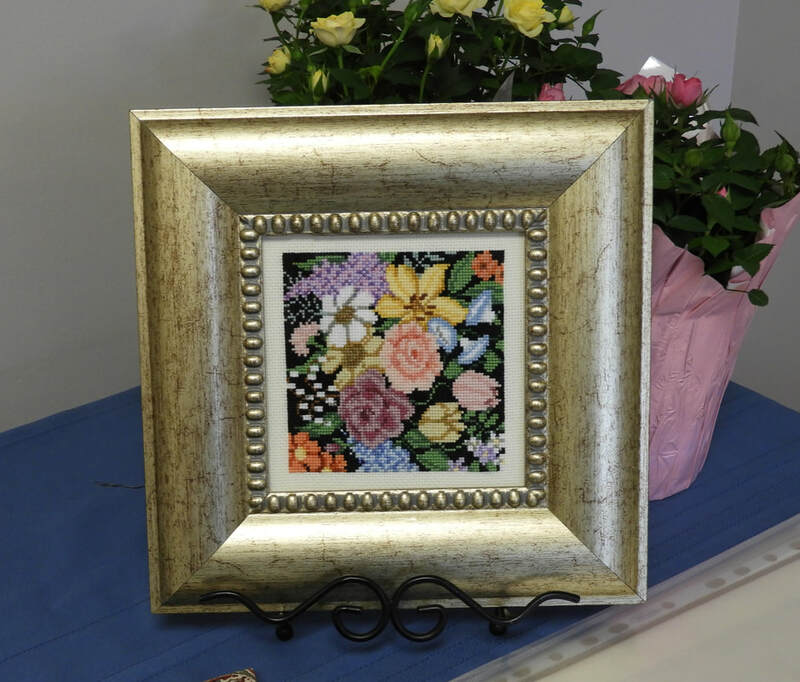 Alda finished and framed her beautiful floral piece. She had a little help from Meagan with the last corner. 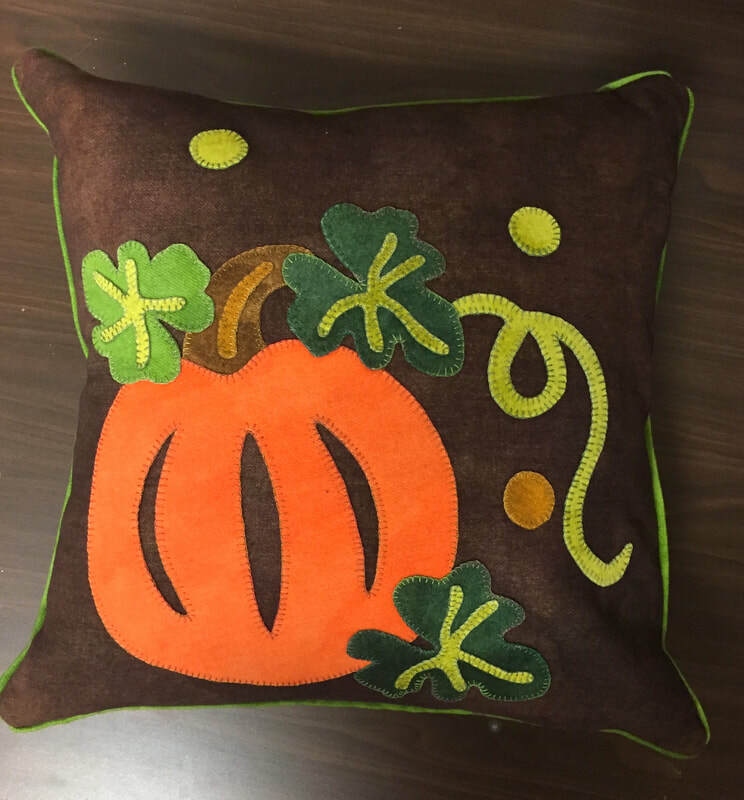 and an autumnal-themed 14" x 14" pillow. 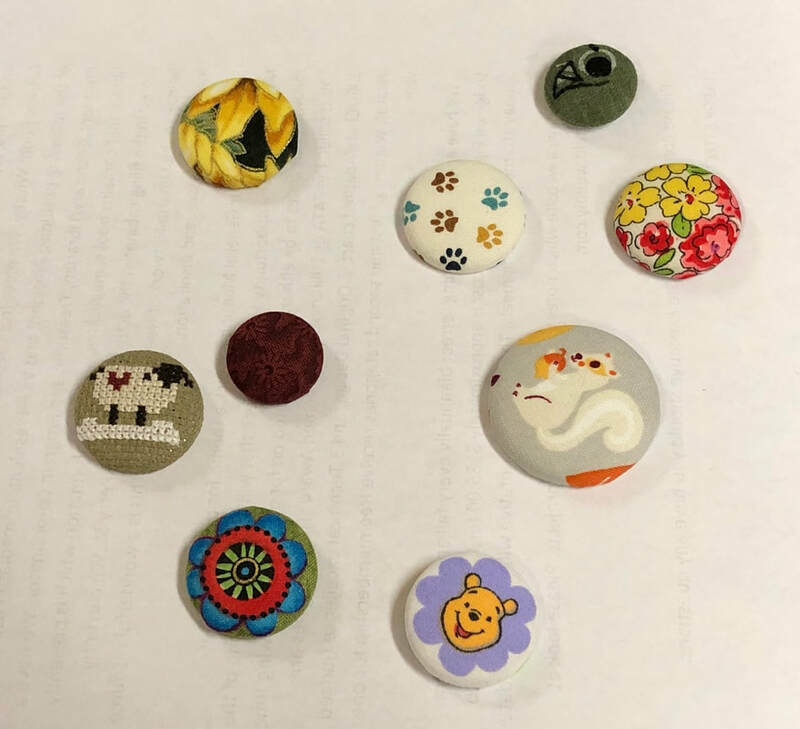 Geri brought in an array of magnetic needle minders she made from little stitched pieces or bits of fabric. Three guests and potential members joined us as well. 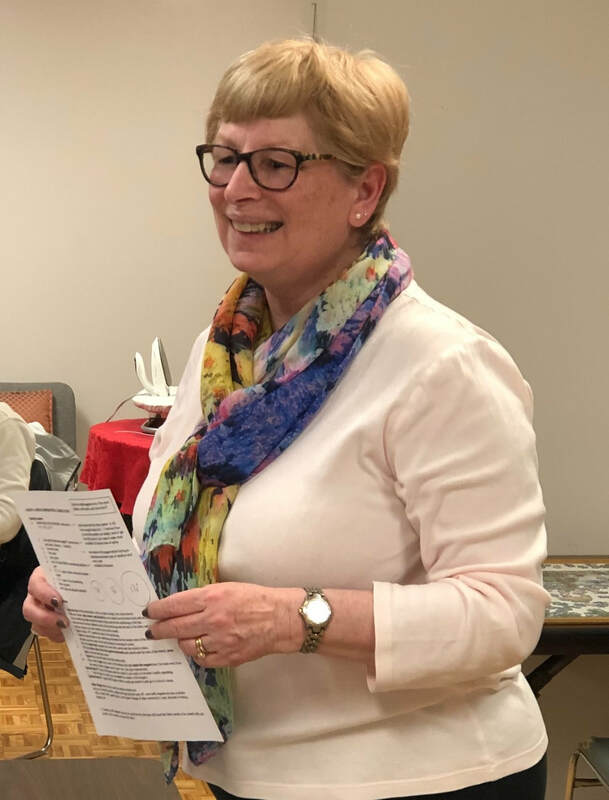 Next meeting will be a 'surprise' program. 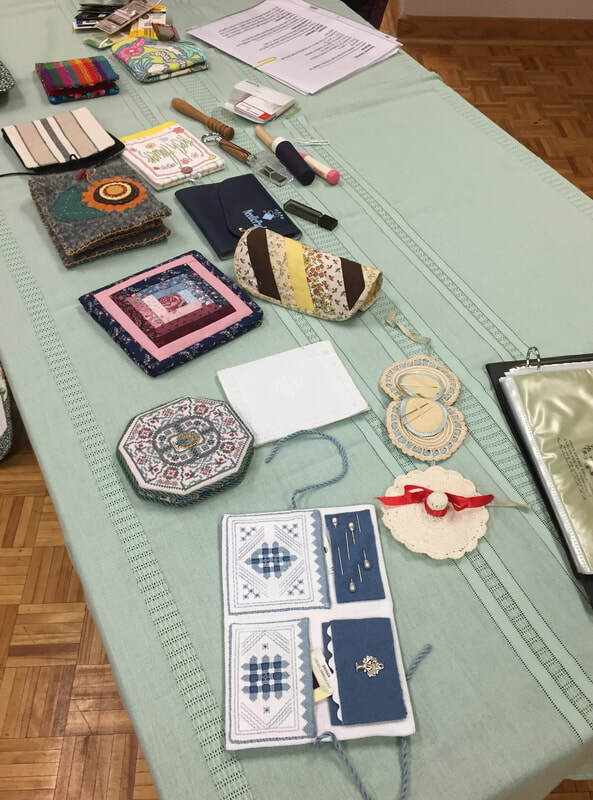 The program for this month's meeting was on storing threads. 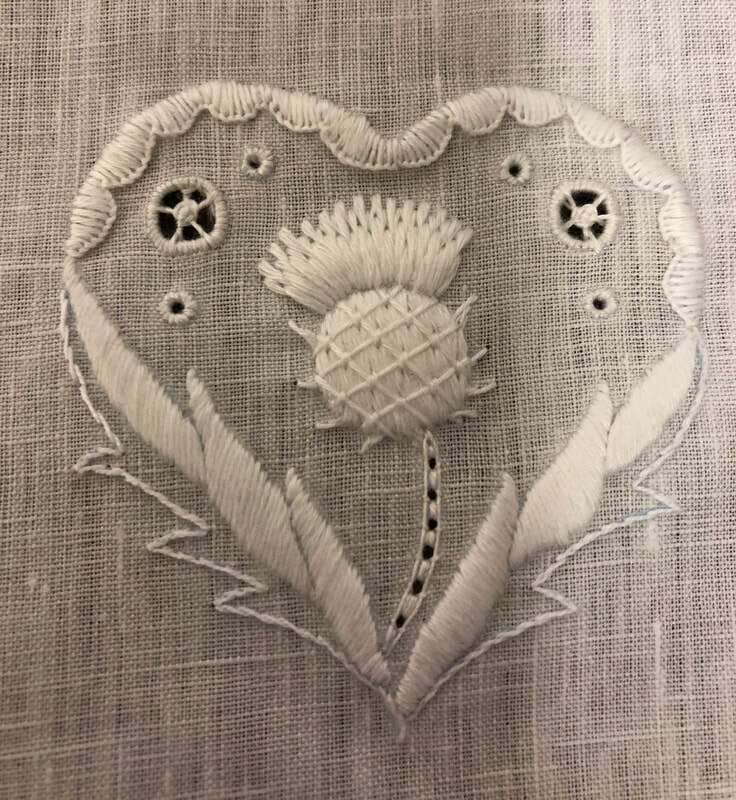 Kim had several suggestions for several different types of embroidery threads: DMC floss, Perle cotton, hand dyed threads, etc. 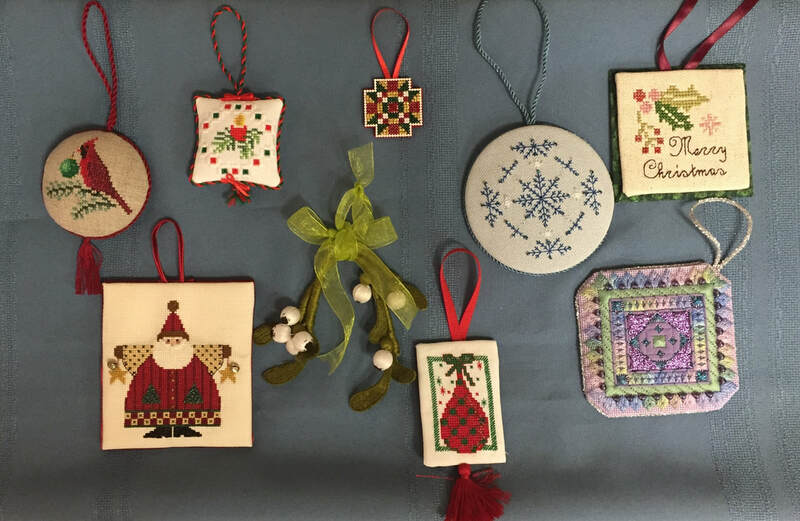 For Show and Share some people brought in a collection of their Christmas ornaments both finished objects (FOs) and finally finished objects (FFOs). 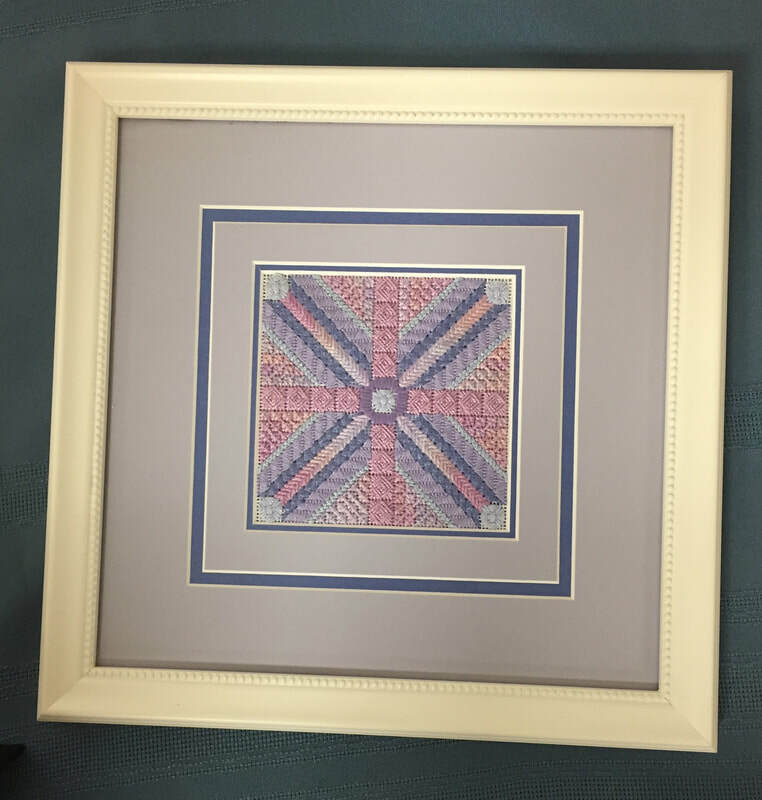 Kim's design, Whitby Whirlwind, is the canvaswork piece she on which she will be instructing us at our special 'stitch day' on Sunday. 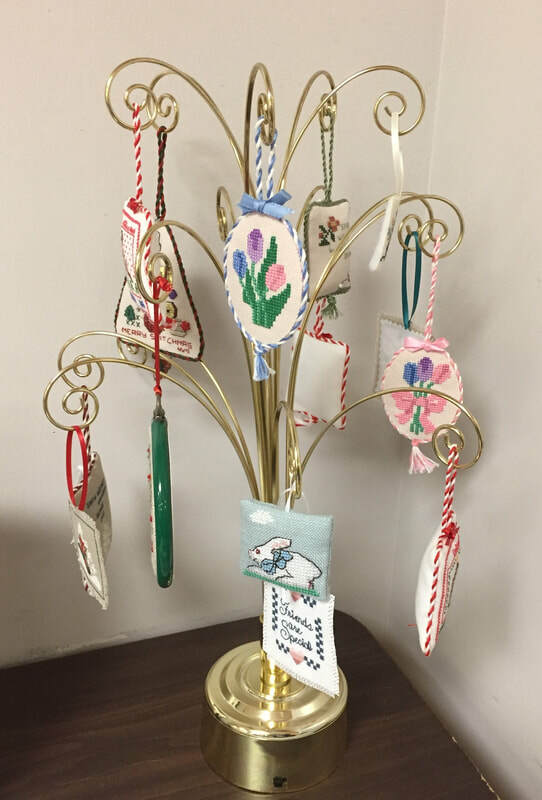 This month's meeting was our light potluck dinner and ornament exchange. 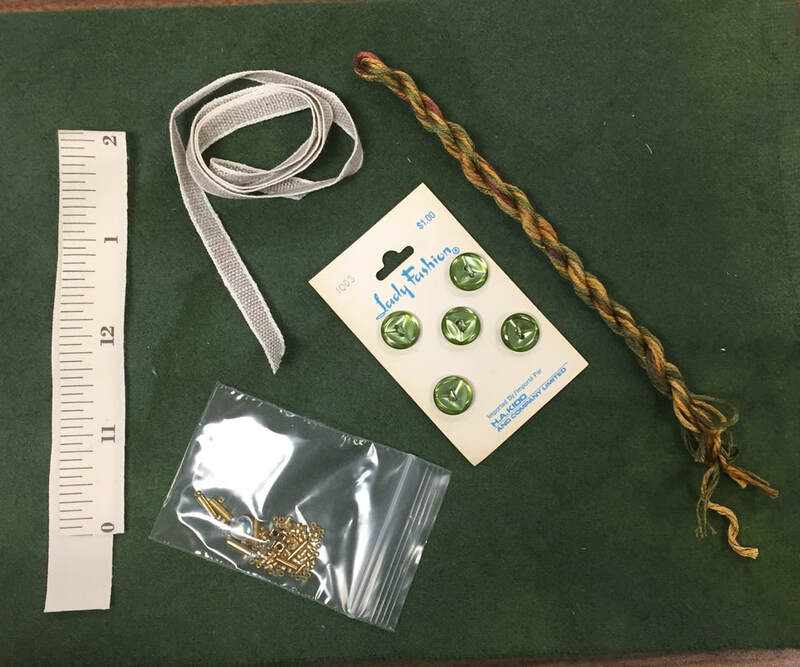 Due to the obligations leading up to the holidays, not many members were able to attend, However, all but one of us participated in the ormament exchange. Kim also had several wrapped 'presents' for us - several of which were donated by other members. 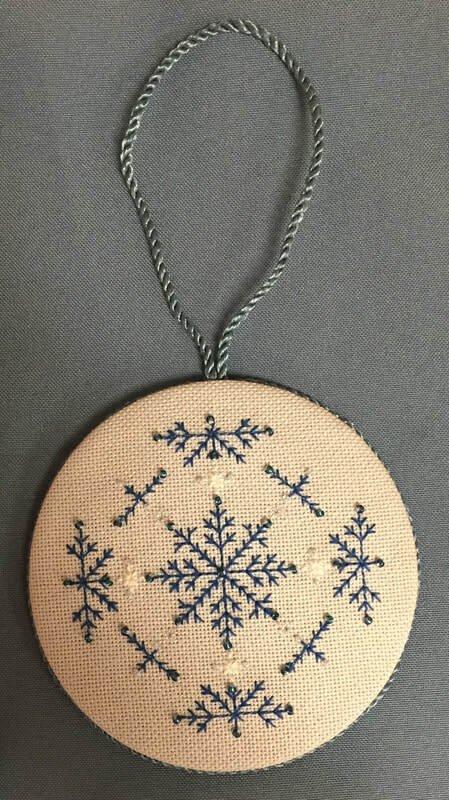 What a treat to not only get an ornament but a nice stitcherly gift, too! 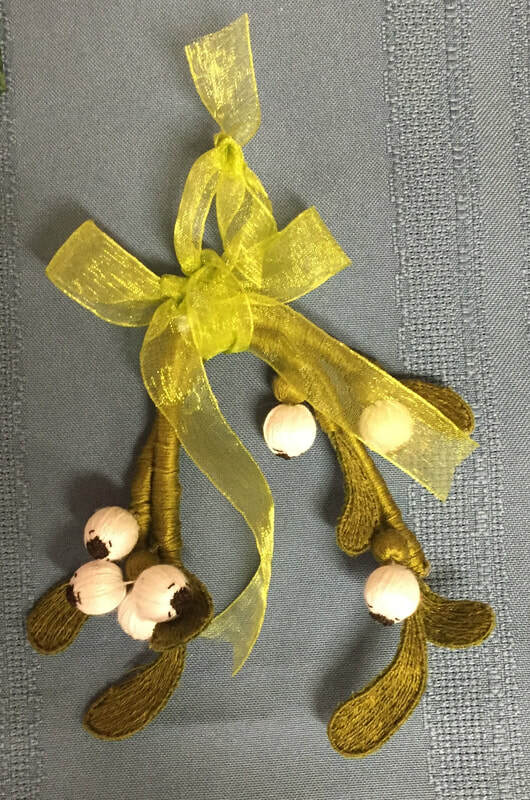 Thanks, Kim, for organizing the treats and ornament swap. It was a really nice way to spend the last meeting of 2018. 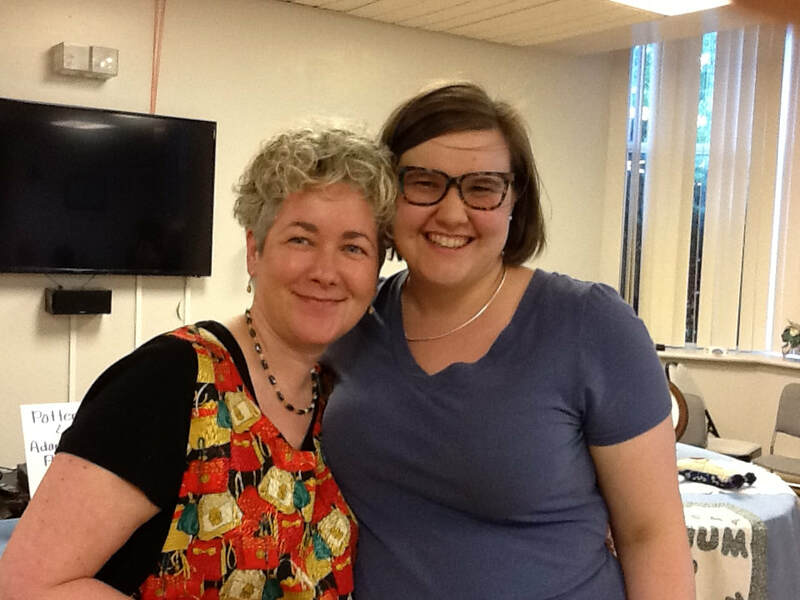 On Sunday, January 20, Kim will be presenting a workshop on a canvaswork project. 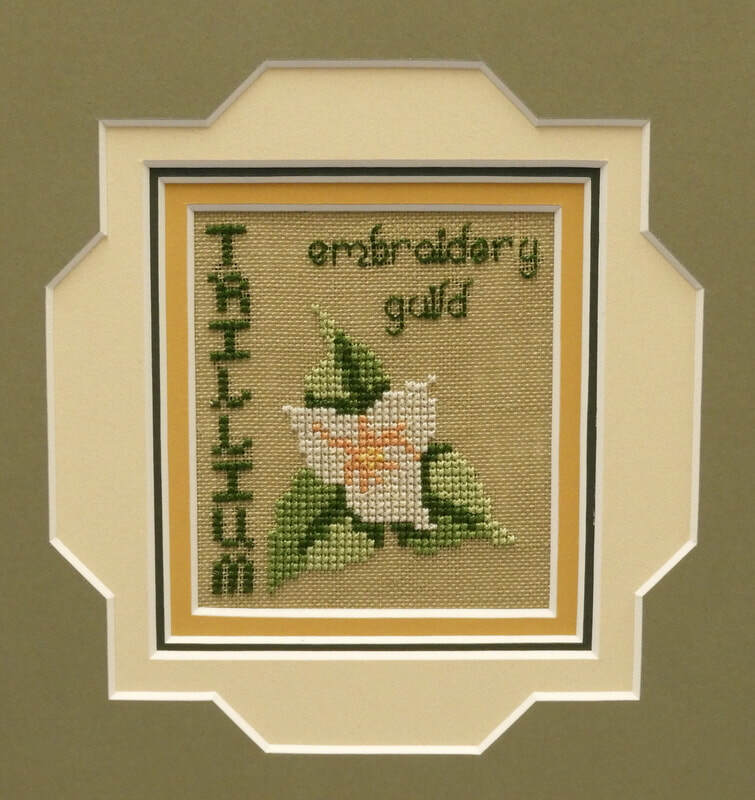 Other members of the guild are welcome to join us for a stitching day. 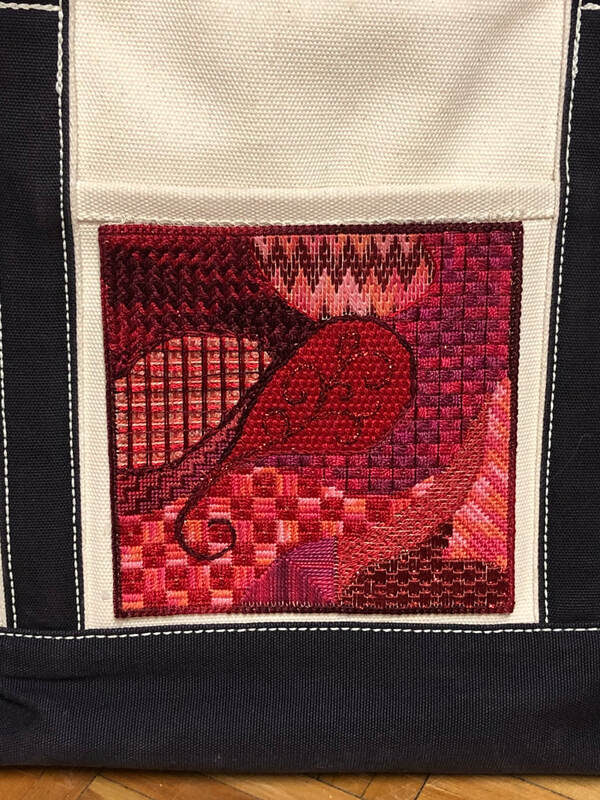 This month's meeting was a stitching meeting. 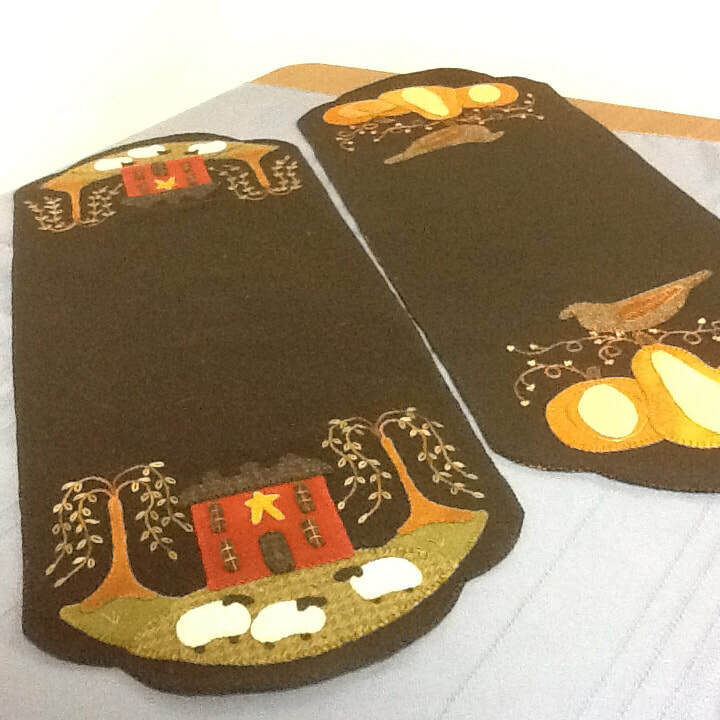 We also decided between two canvaswork pieces for the workshop that Kim will conduct in January. We decided on the latter one. 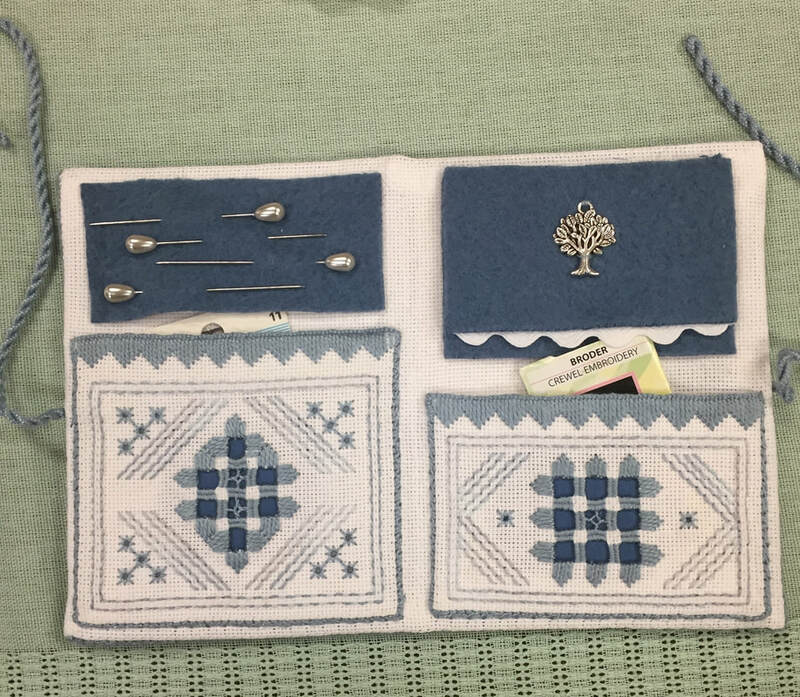 There were several items for 'Show and Share'. 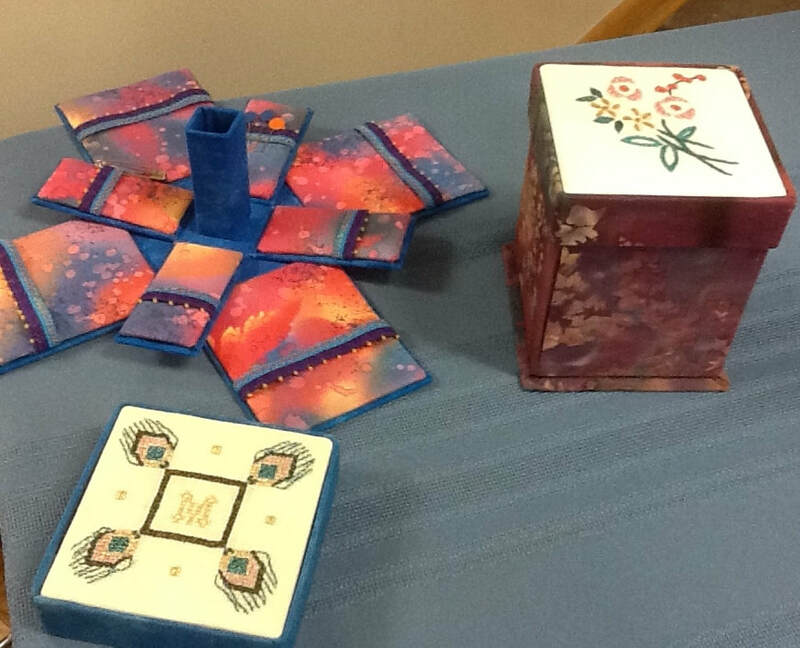 Jen showed off the needlecase she made with items from the guild's challenge. 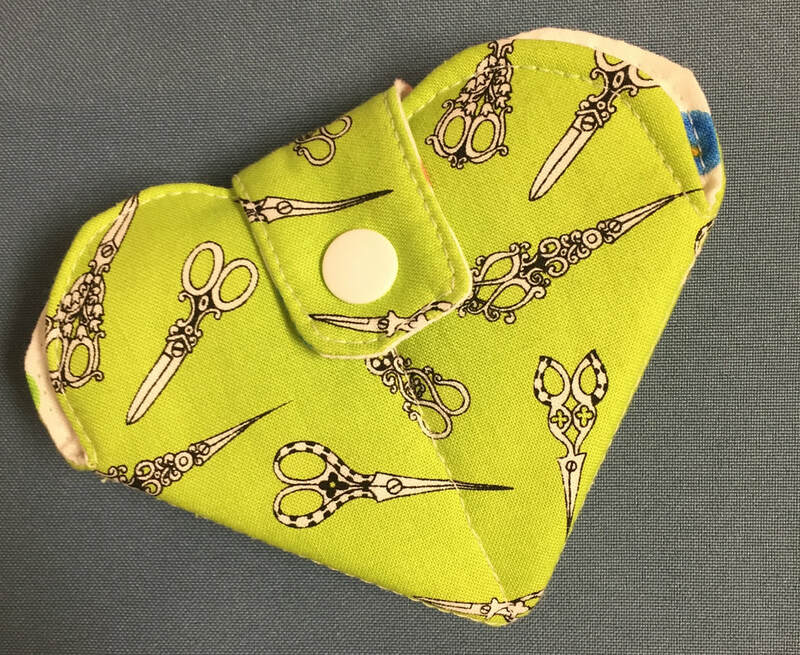 Geri made a needlecase from the same pattern. 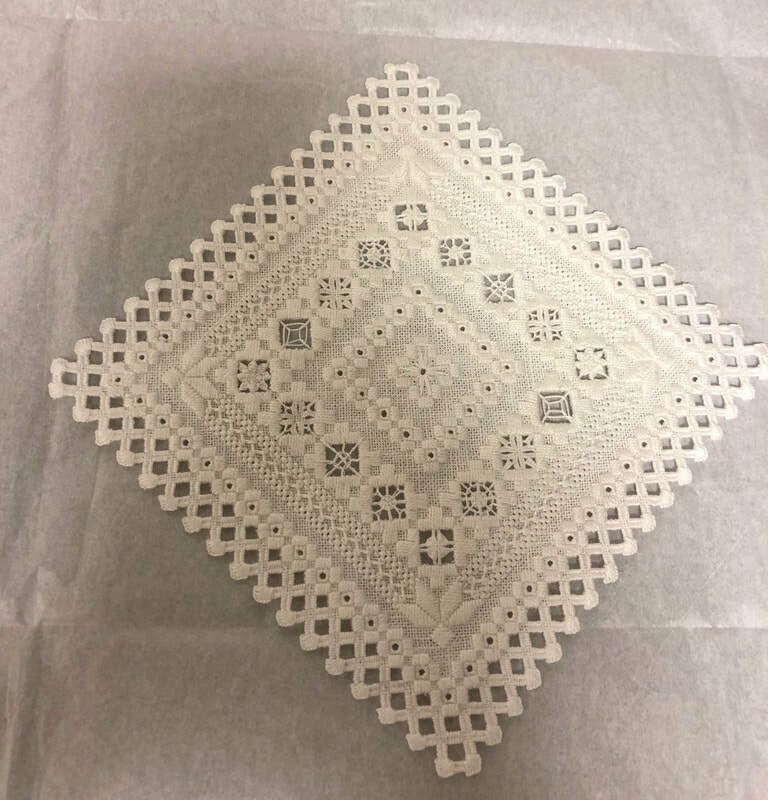 She also brought in a Hardanger piece - a family heirloom that is over 100 years old. 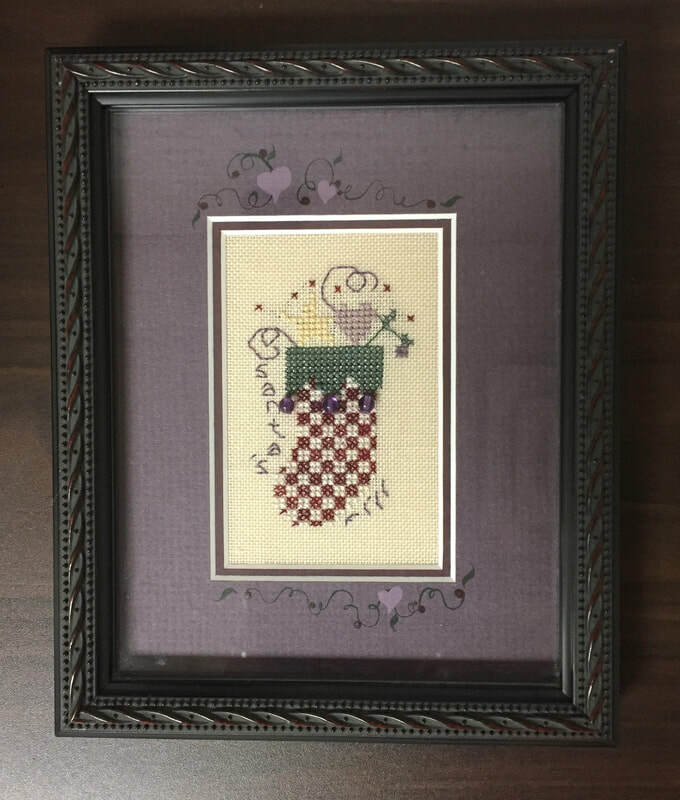 Marilyn stitched this Mill Hill Buttons and Beads kit on perforated paper. 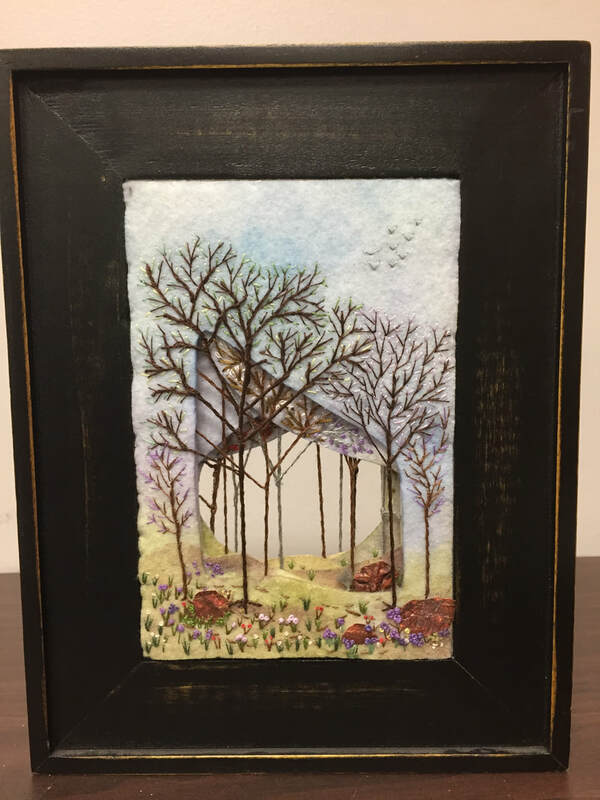 Marion stitched this Trish Burr thread-painting piece. 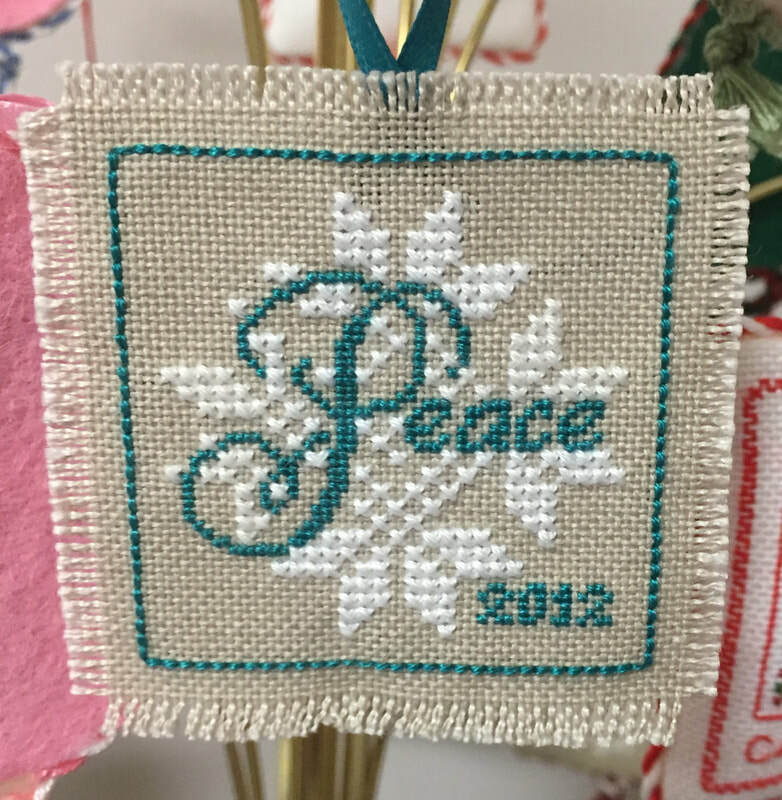 Next month's meeting will be the ornament exchange and pot luck with finger foods. 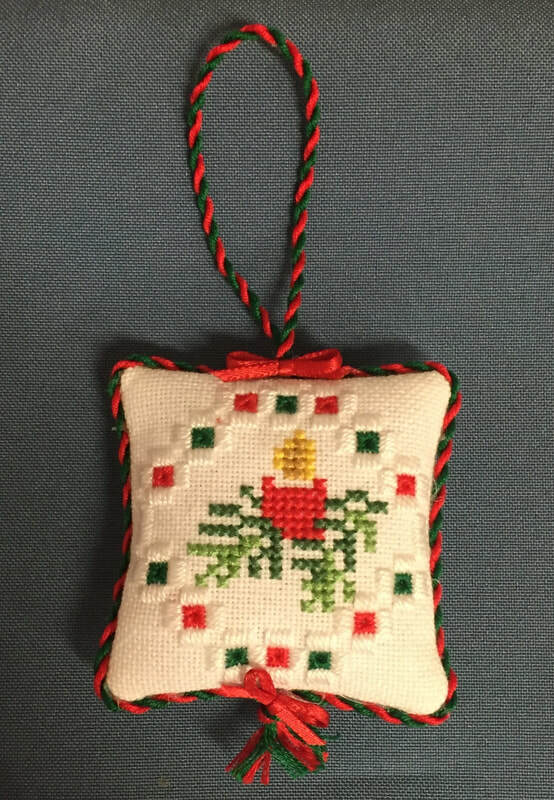 Members are reminded to bring plates, cups, and utensils and if participating in the exchange, a wrapped Christmas ornament. 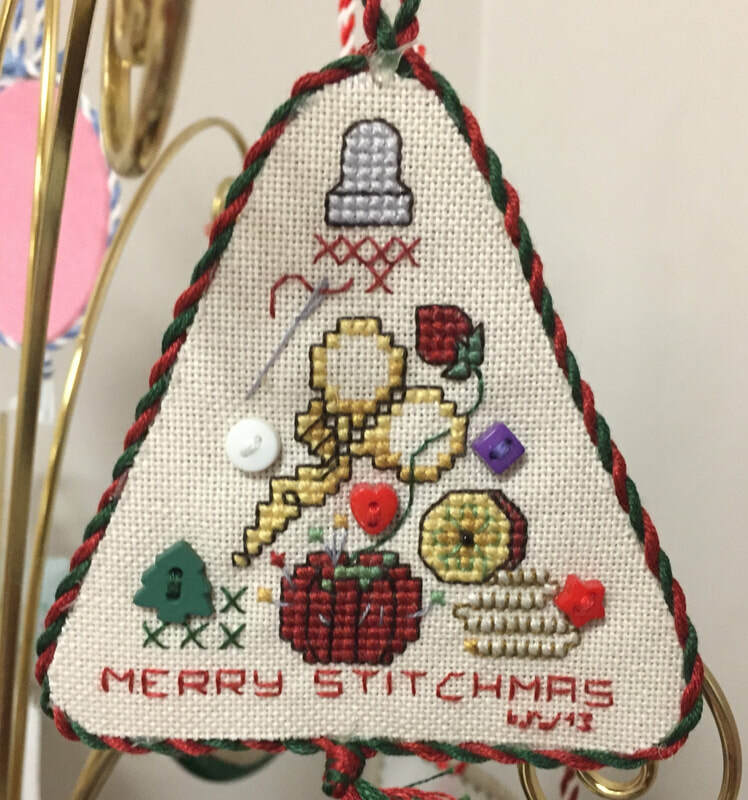 This month's program was all about needles. 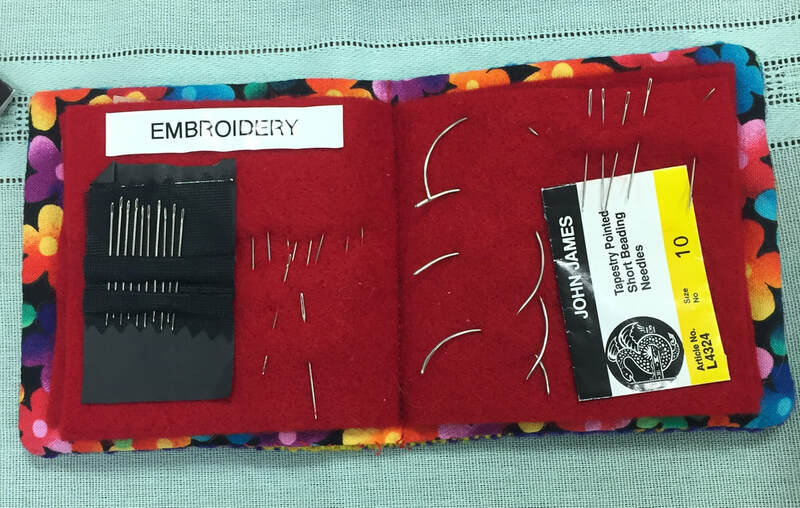 Kim spoke about how they're made, the functions of different types of needles, and how to store them. 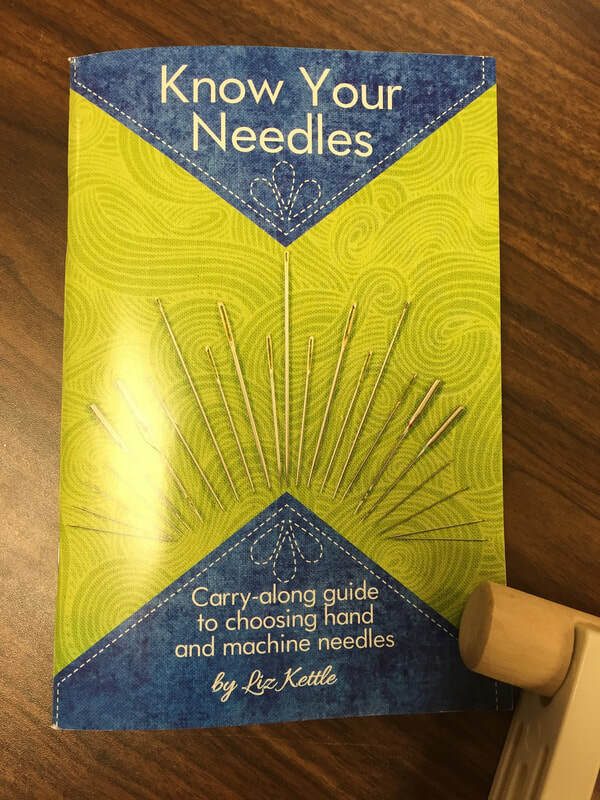 This is a useful guide to needles. 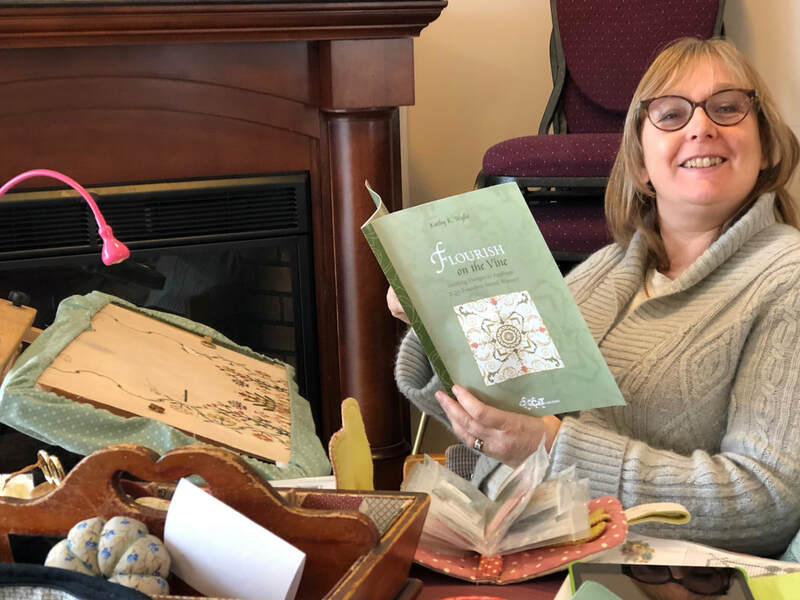 She showed us an array of needlebooks. 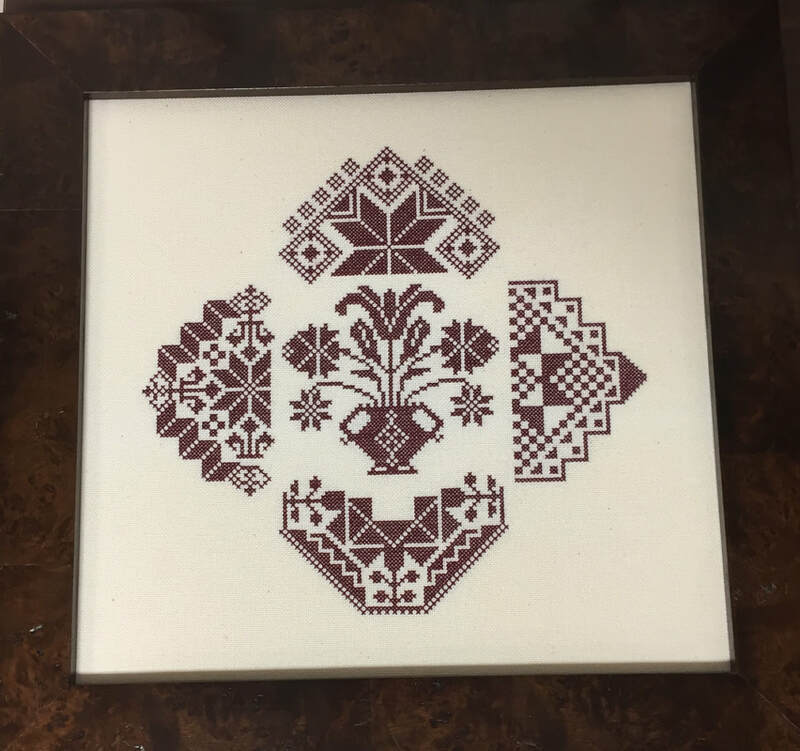 A cover of one of the needle cases. 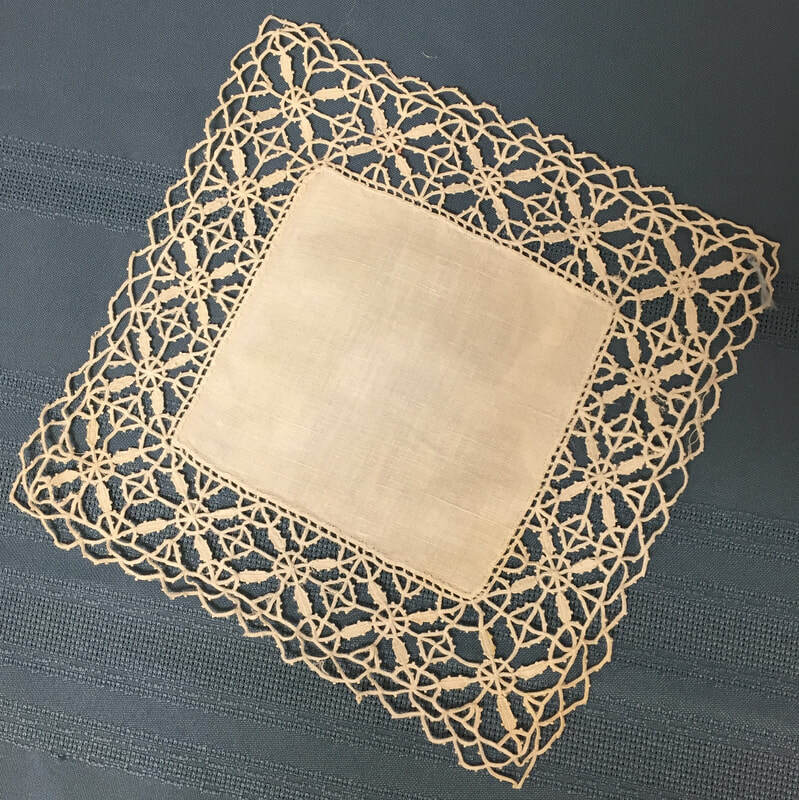 or a piece of woven fabric. The 'pages' inside can be labelled. 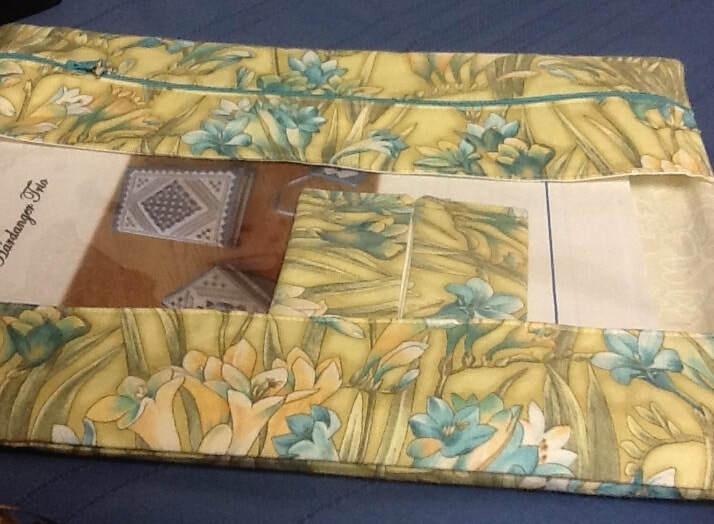 This one folds up into a case with a snap closure. 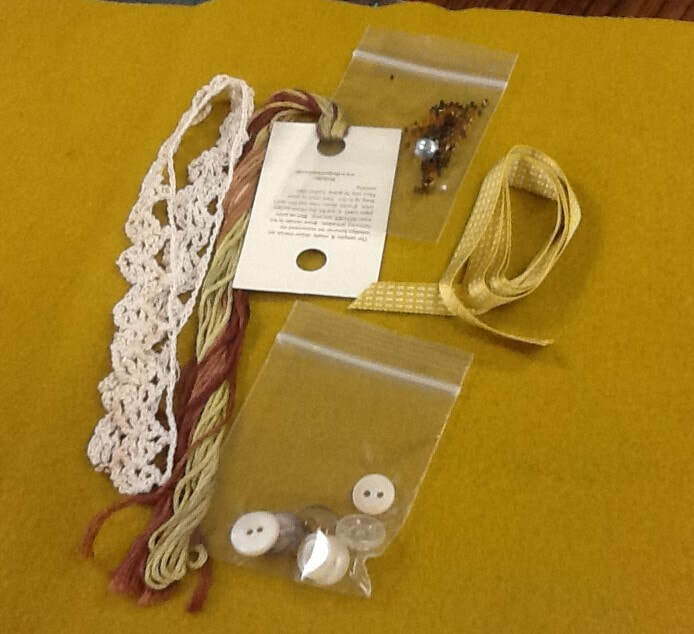 We each took a little kit with a piece of felt and random findings - buttons, beads, ribbon trims and threads. 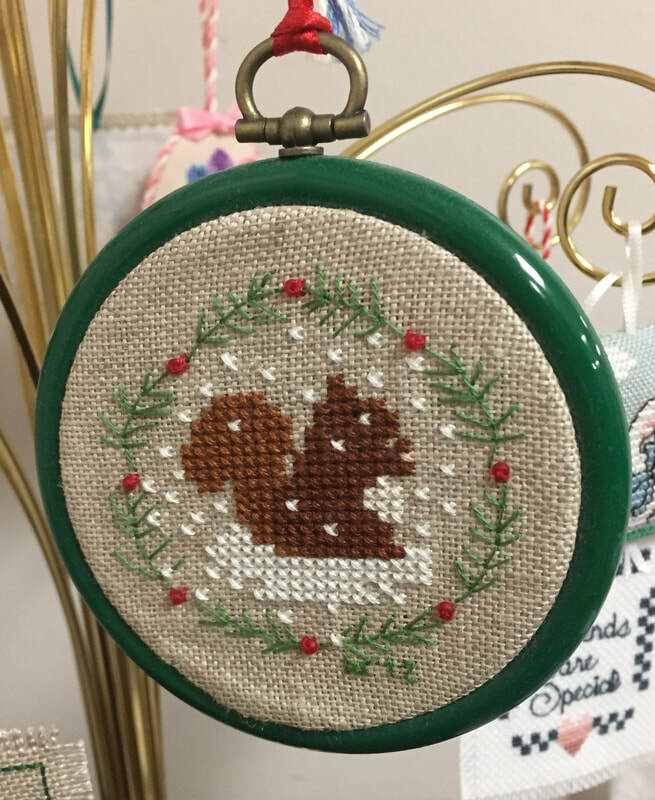 We can then make our own little needlebook. 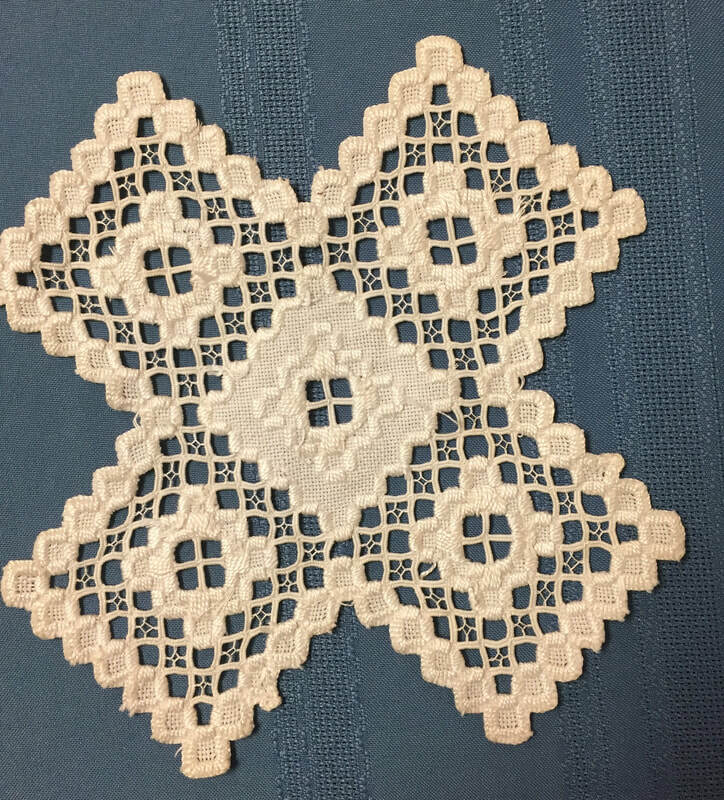 Jeanette shared an heirloom piece of tatting given to her by her mother. 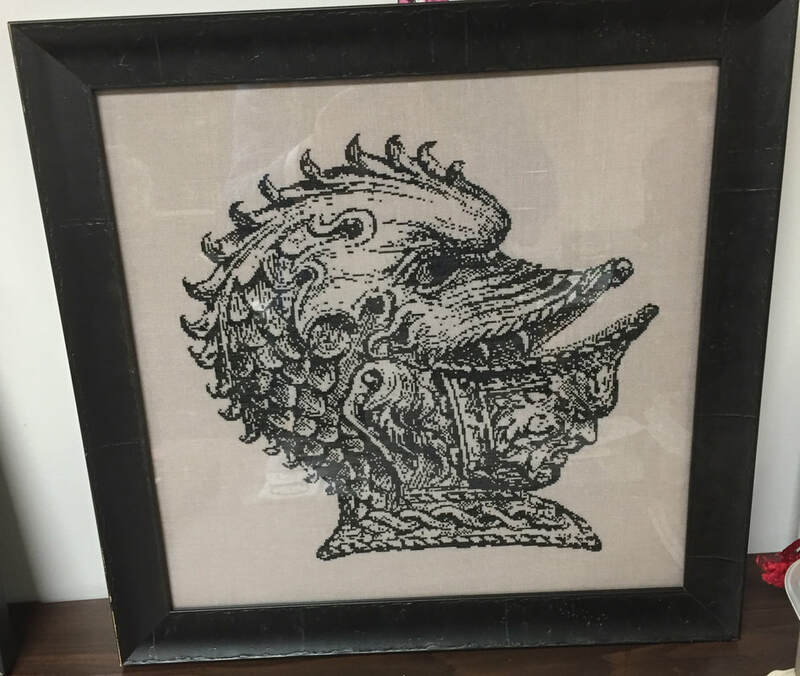 One of Jeanette's earliest piece. 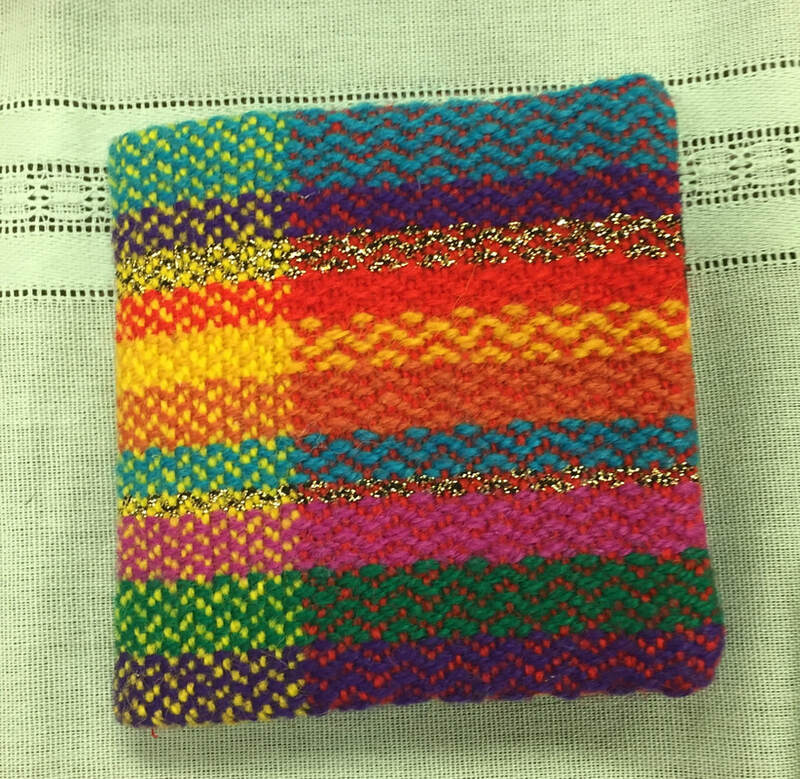 Geri's 15-sided pulled thread biscornu. 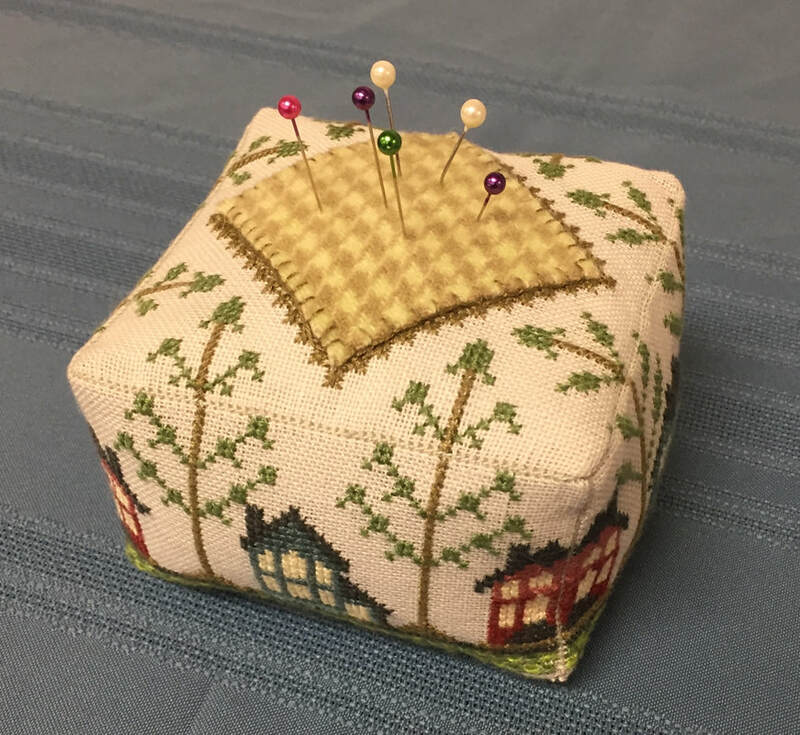 Geri's 'Block Party' Home pincushion. 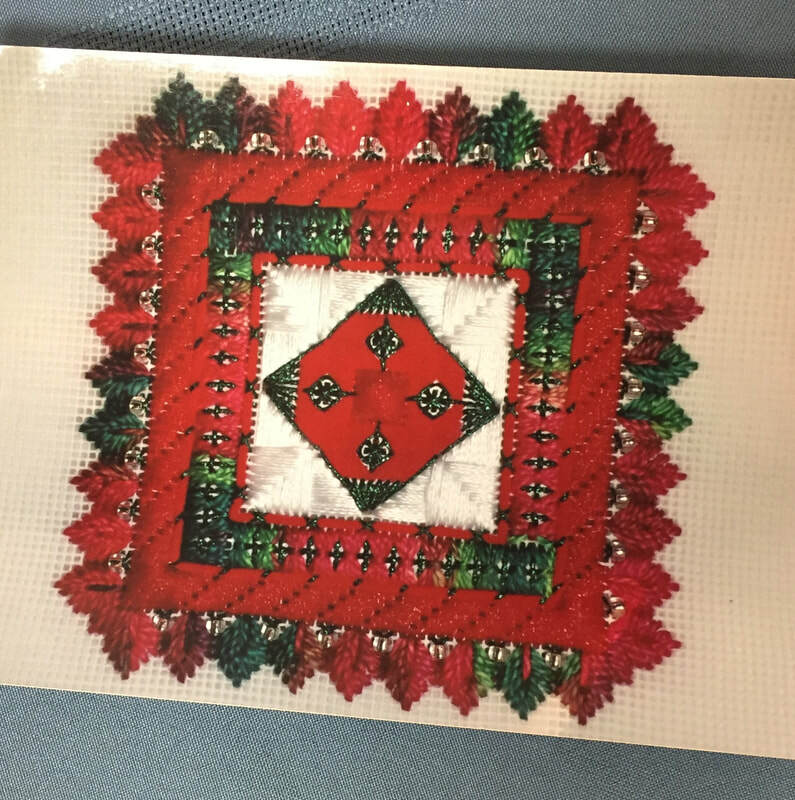 Geri's 'Dans Mon Jardin' 15-sided biscornu. 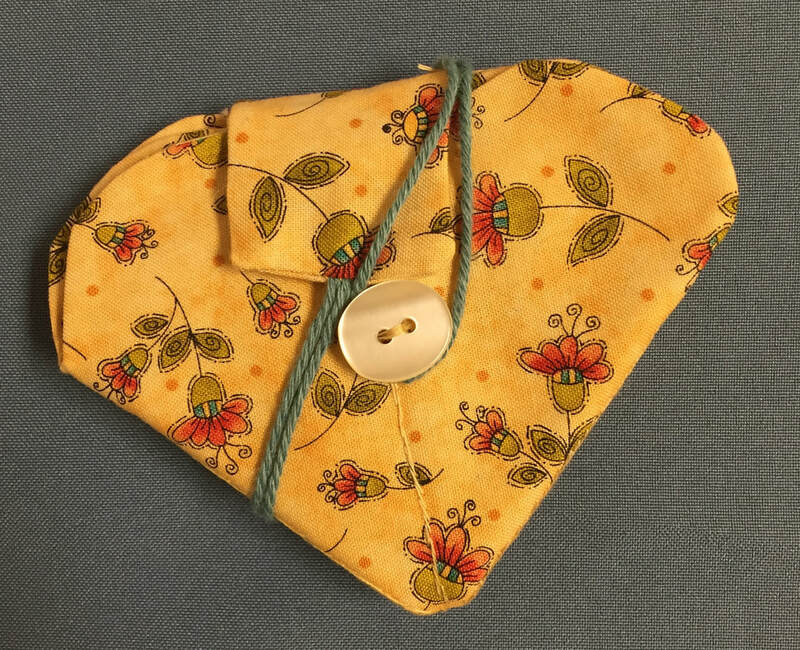 Shelley shared the two project bags she made. 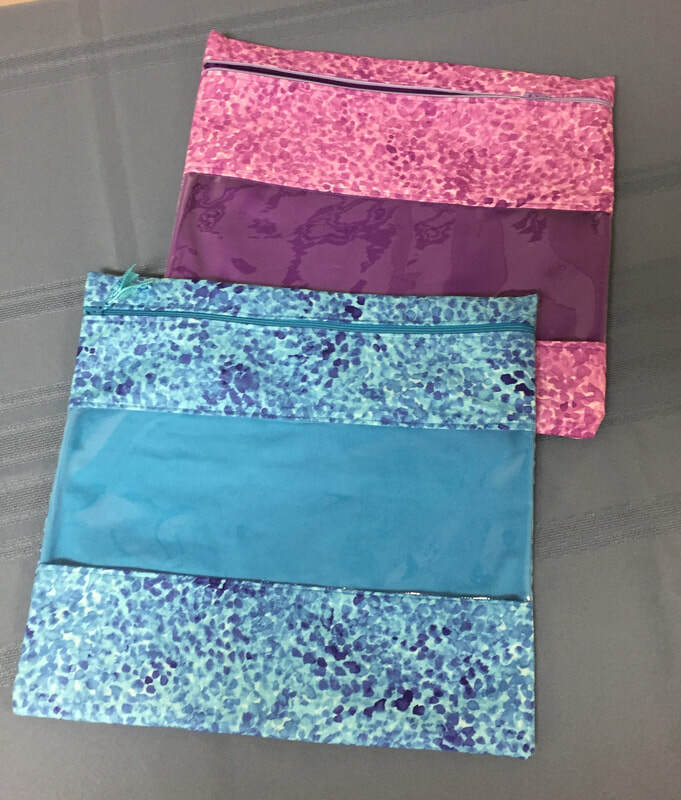 Each one has a vinyl window and zipper closure. This week was our last meeting before the summer. 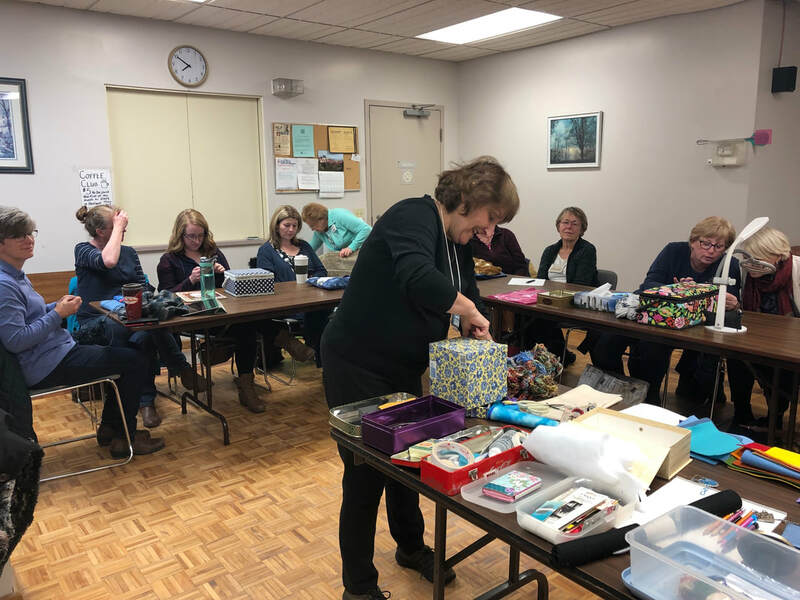 At the meeting, we determined officers and other positions for next year, voted on the embroidered pieces for the three prizes, had 'show and share', and ate goodies. Jennifer's design won the Technical Award. 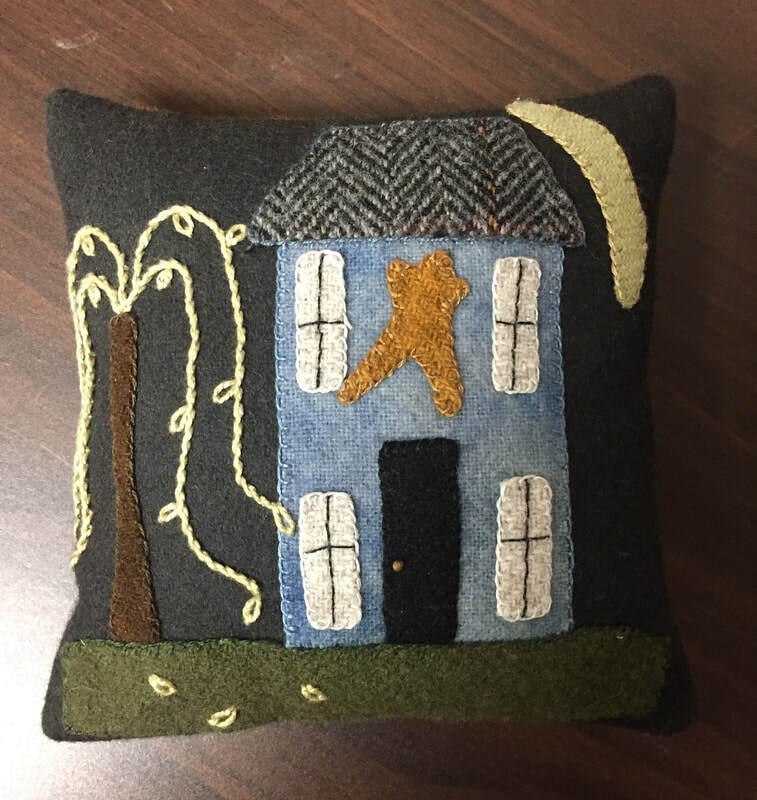 Her design incorporates many of her passions: cats, music, Star Trek. 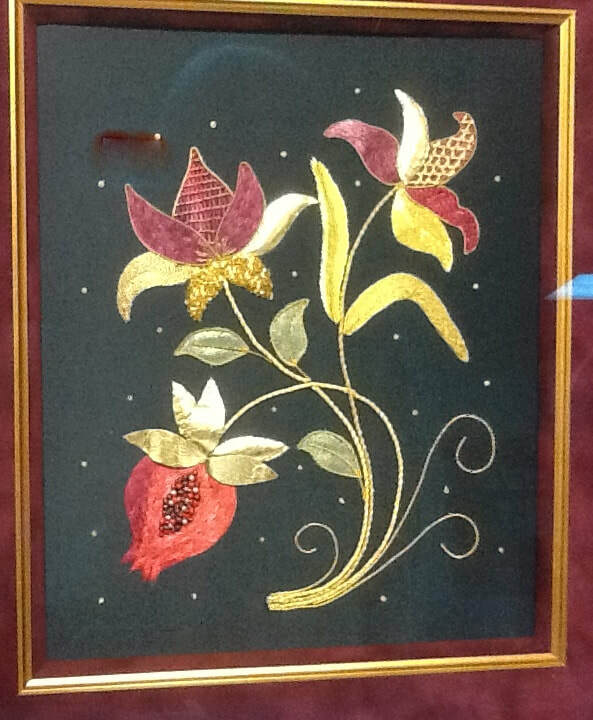 thread painting, embroidery, etc. 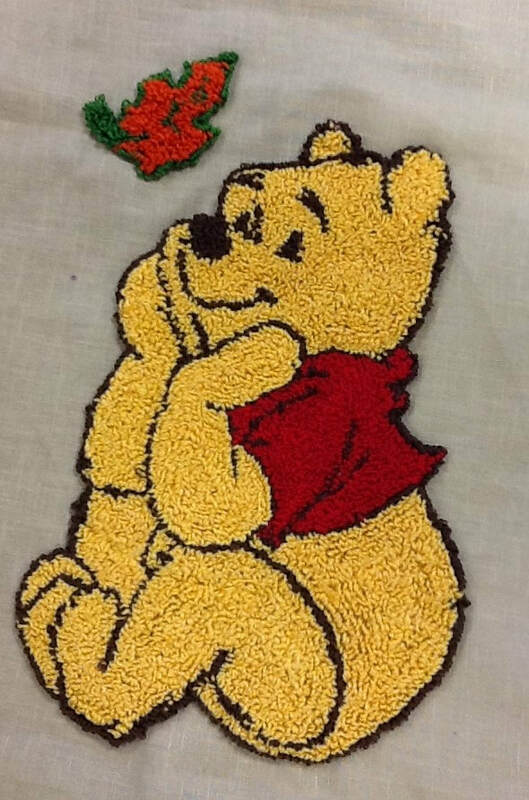 It is so creative and beautiful. 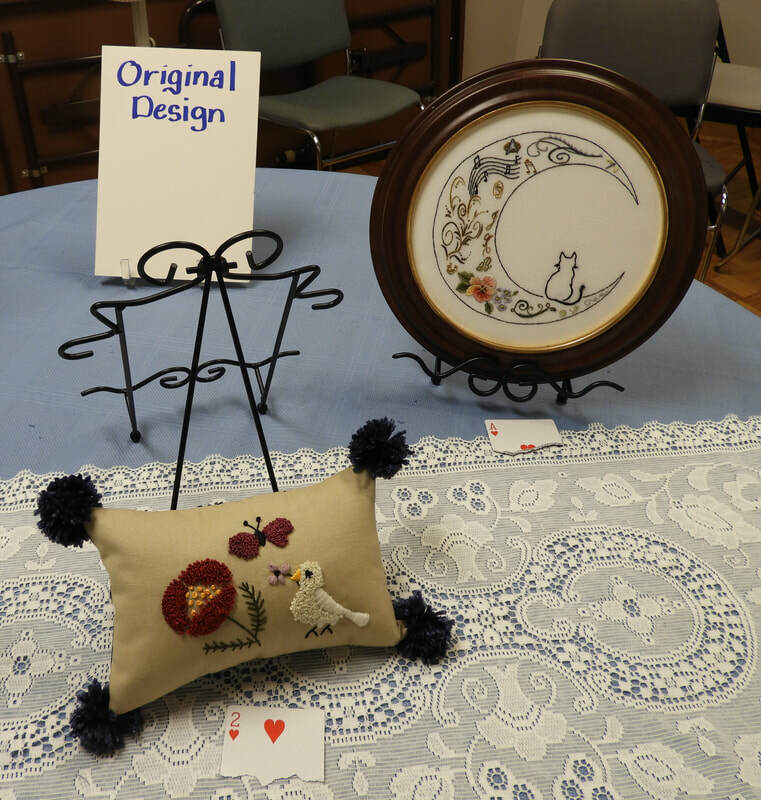 Diane's punch needle and embroidered pillow won in the Original design category. 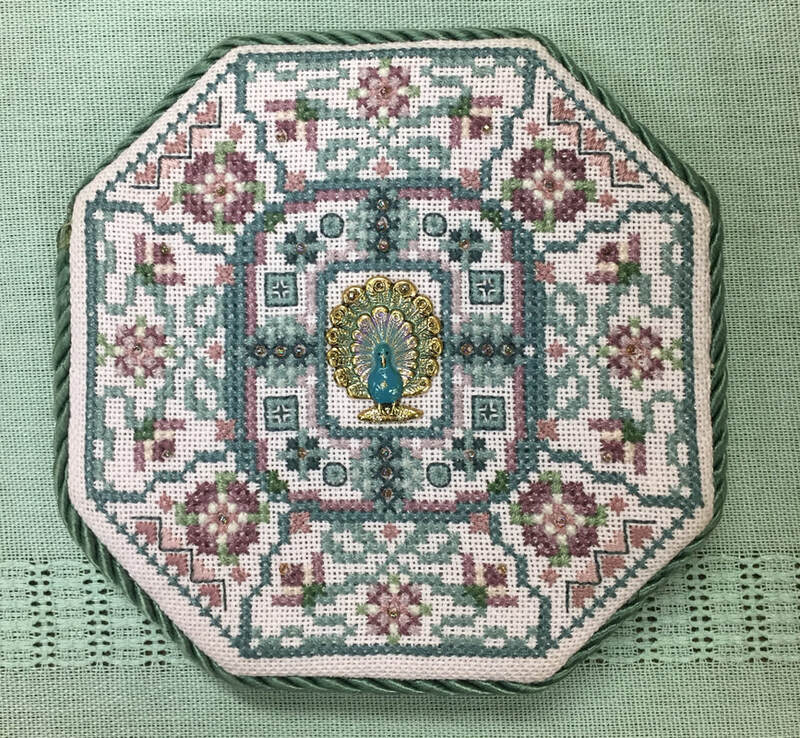 Jeanette's peacock piece "Maxim and Zoya" from Plum Streeet Samplers won the award for the Charted/Adapted design. 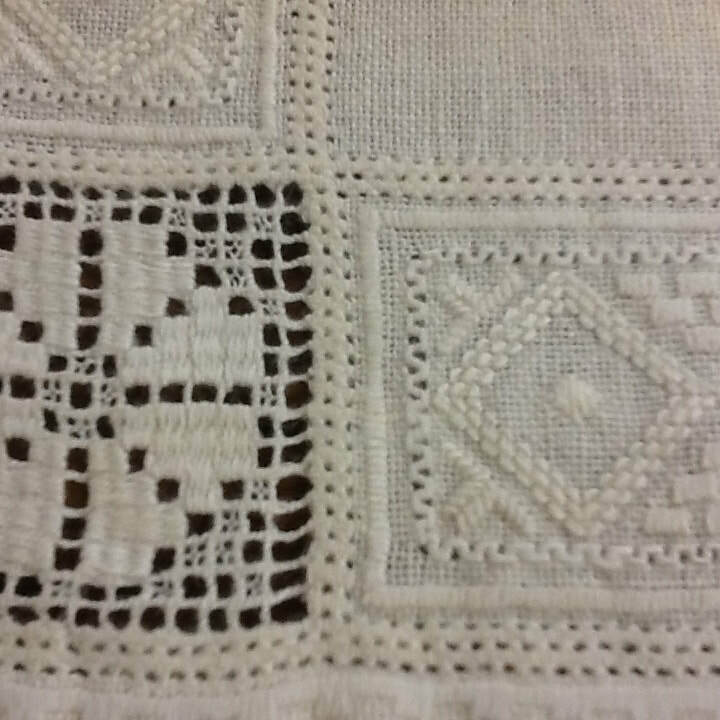 It is stitched over 1 thread on 32? 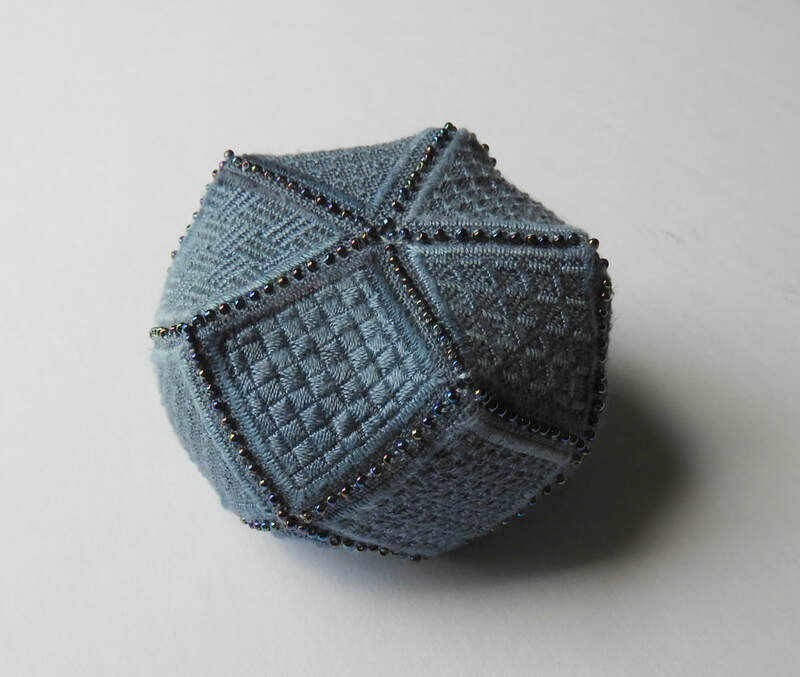 count fabric. 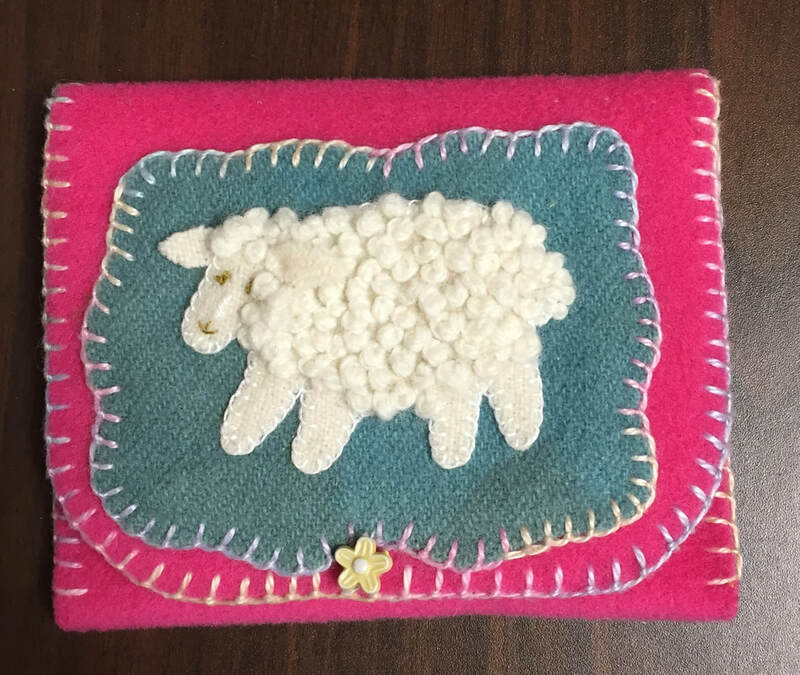 Other entries included Bernie's sheep mounted on a badge. 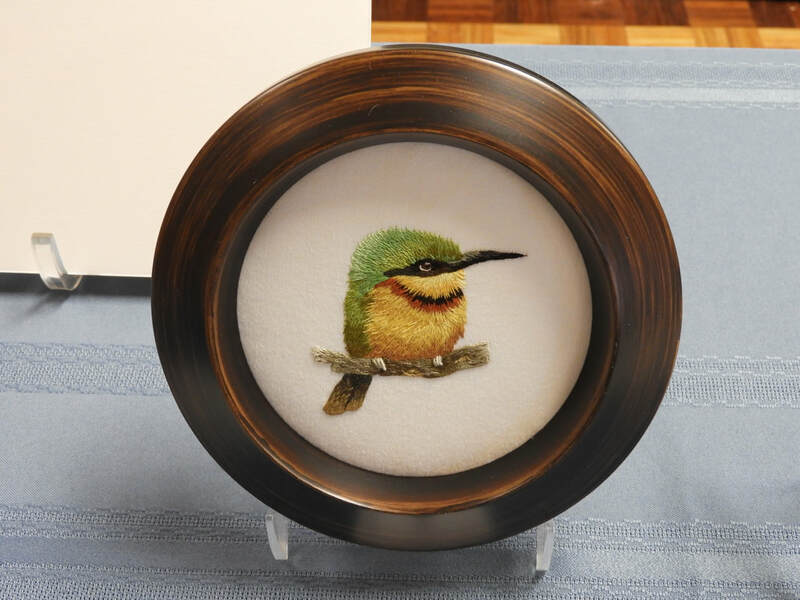 Jennifer's painted thread Bee Eater designed by Trish Burr. 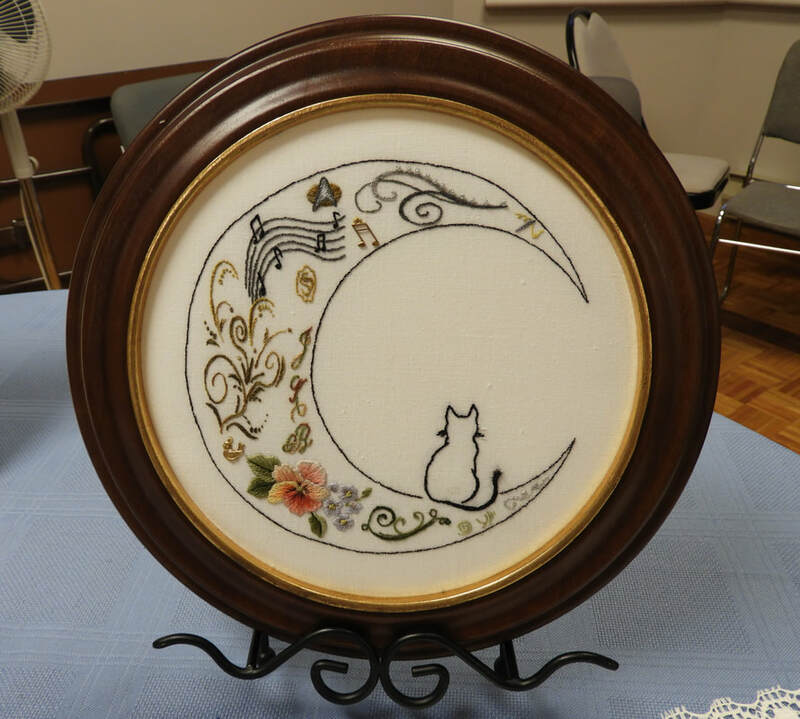 Jen stitched this in one day at the last Elim retreat! 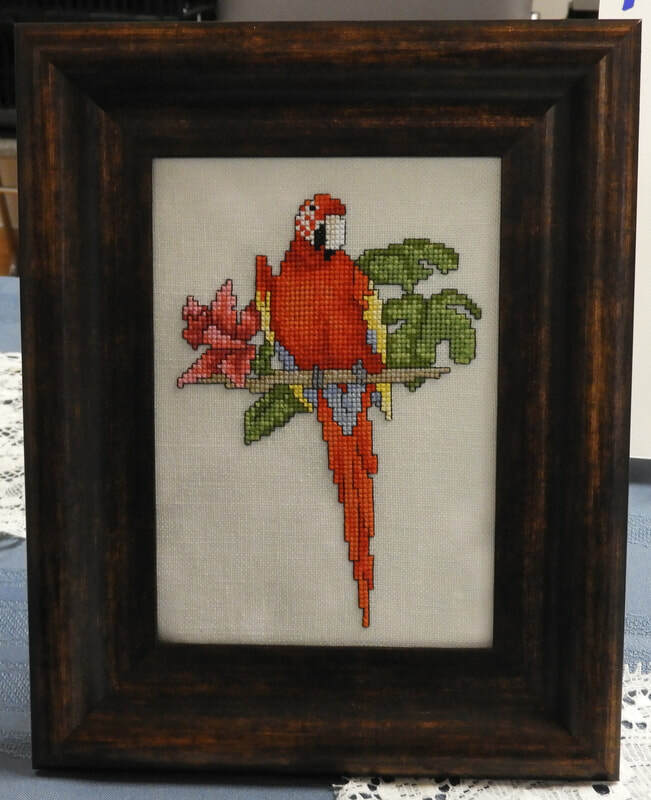 Geri's 'Red Bird' punch needle piece designed by Karla Gerard and adapted to punch needle by Loretta Moore of 'Hooked On The Lake'. 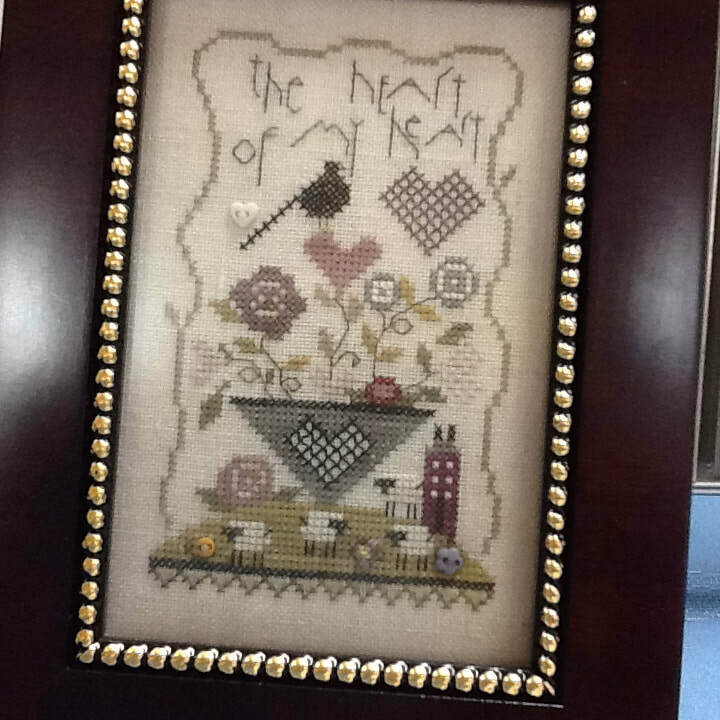 The 'Heart of My Heart' piece is a Shepherd's Bush design. 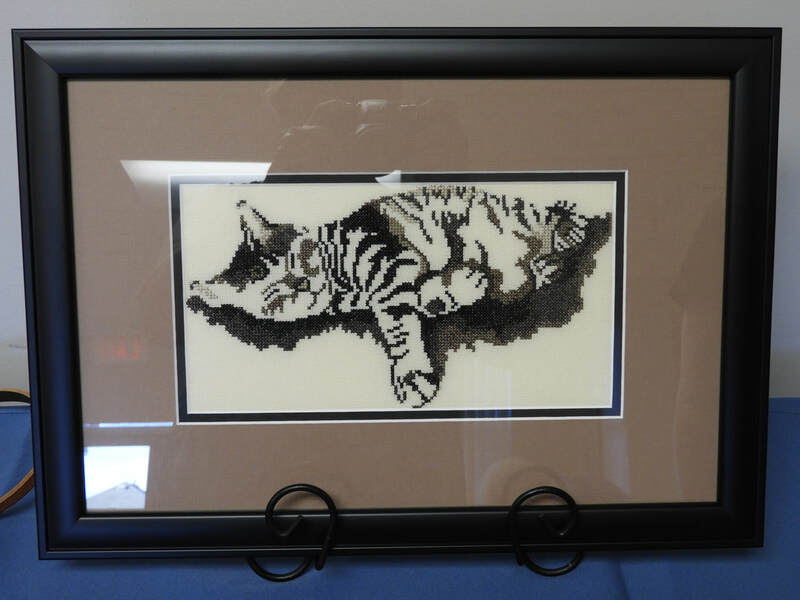 Jen brought in a stitched piece of her beloved cat, Abby, from when Abby was a kitten. 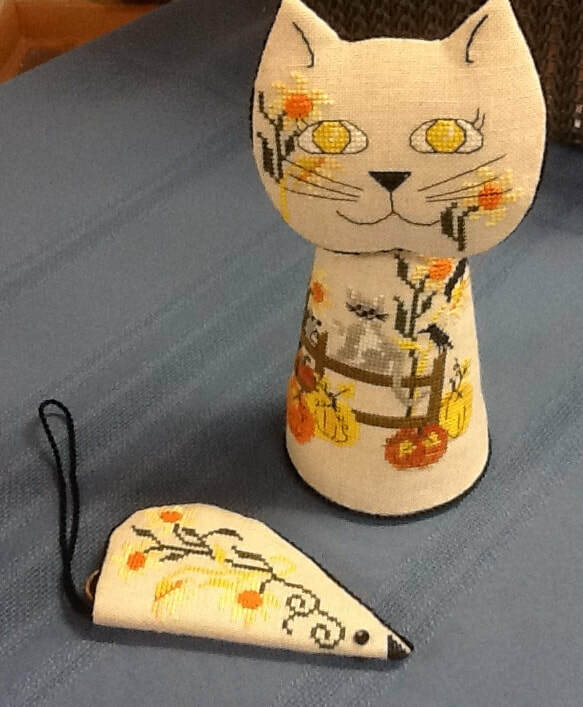 She also brought in a kitty cat biscornu. 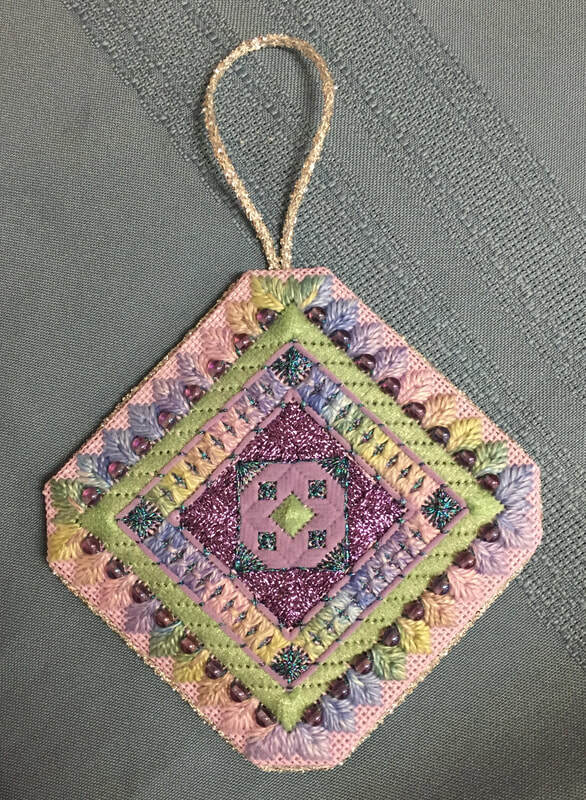 She finished up this one recently. 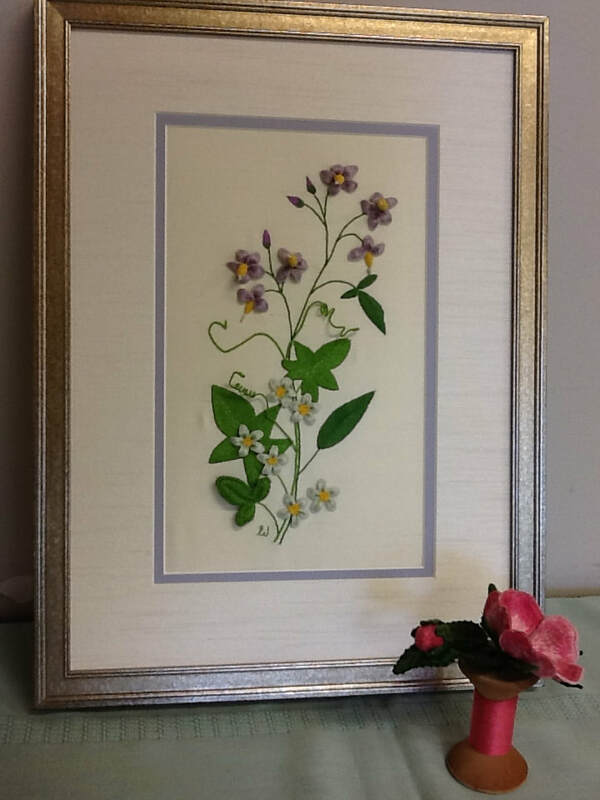 The detail on Marion's thread painted piece is exquisite. 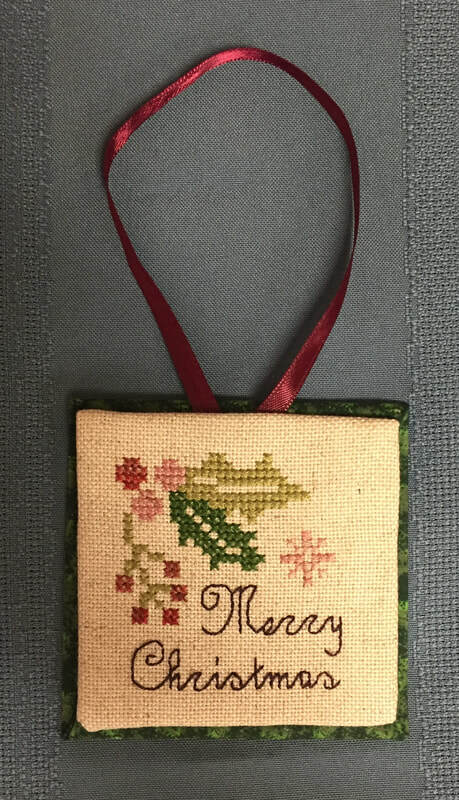 Jeanette brought in her luggage tag made with embroidery stitch fabric. 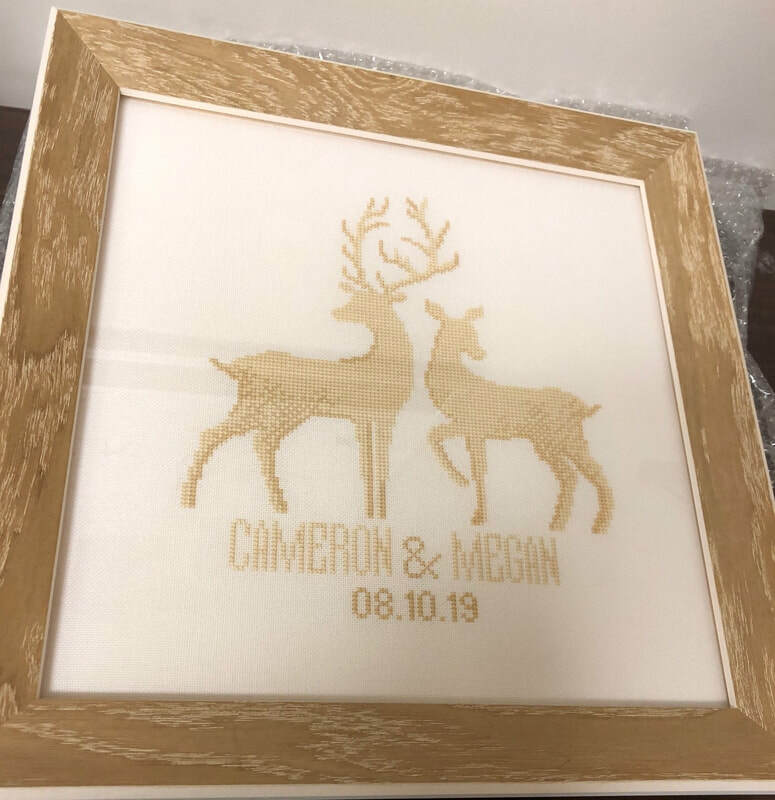 It opens up to reveal the address or business card. 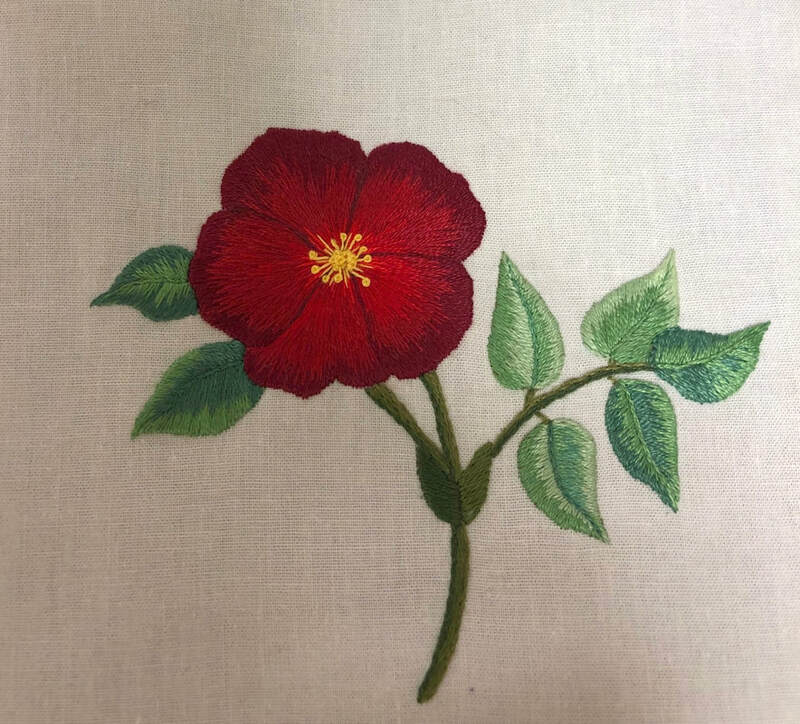 ​Alda shared this beautiful floral piece stitch on rather fine fabric. 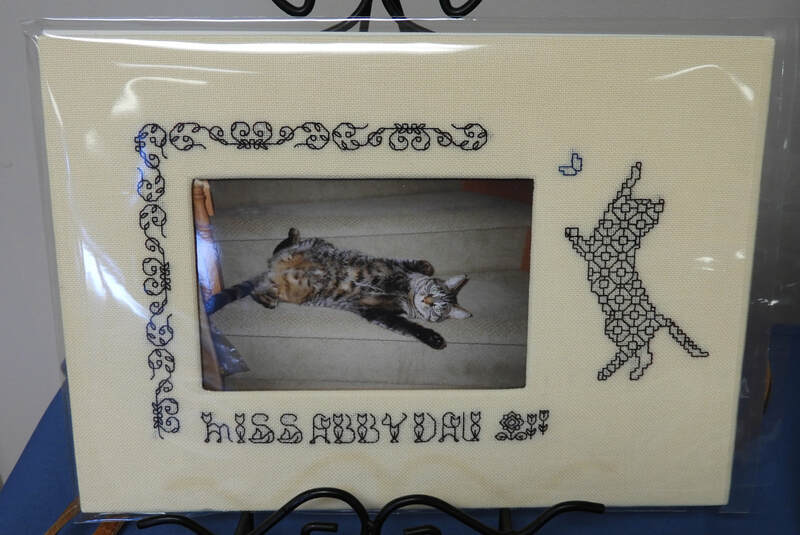 ​Jen also shared this blackwork frame she stitched for this photo of Abby. 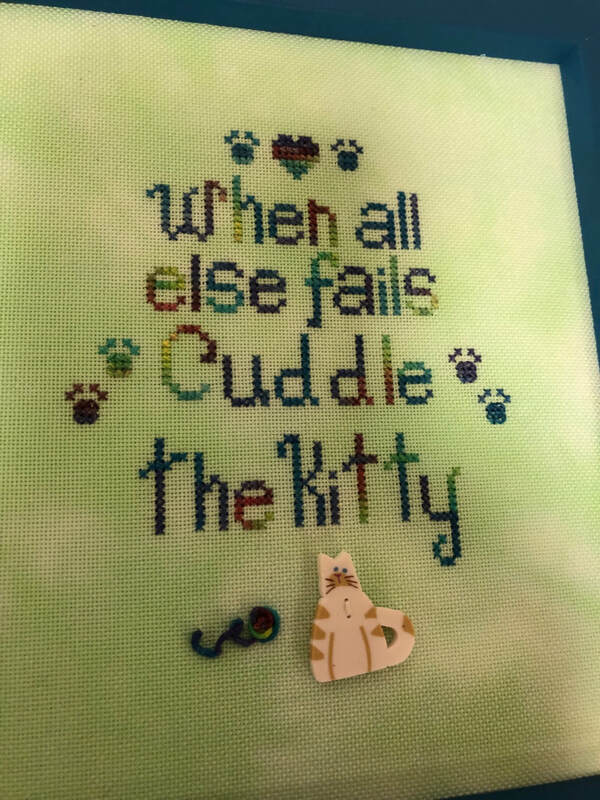 The letters on the bottom are a 'kitty cat' font. 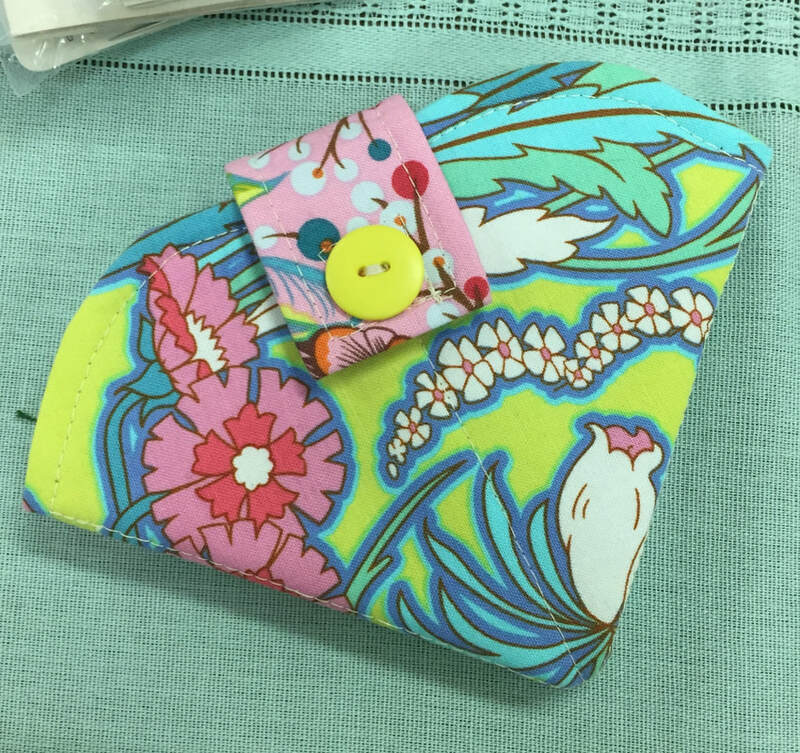 Jeanette shared her idea of using a decorative notepad with the magnetic closure for a needlecase. 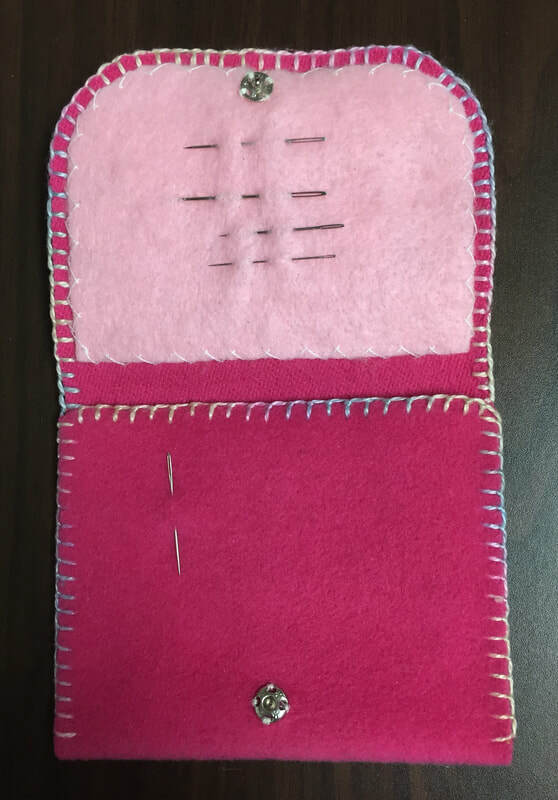 She took out the notepad and glued in several 'pages' of felt, cut to fit. Our theme for next year was decided upon. 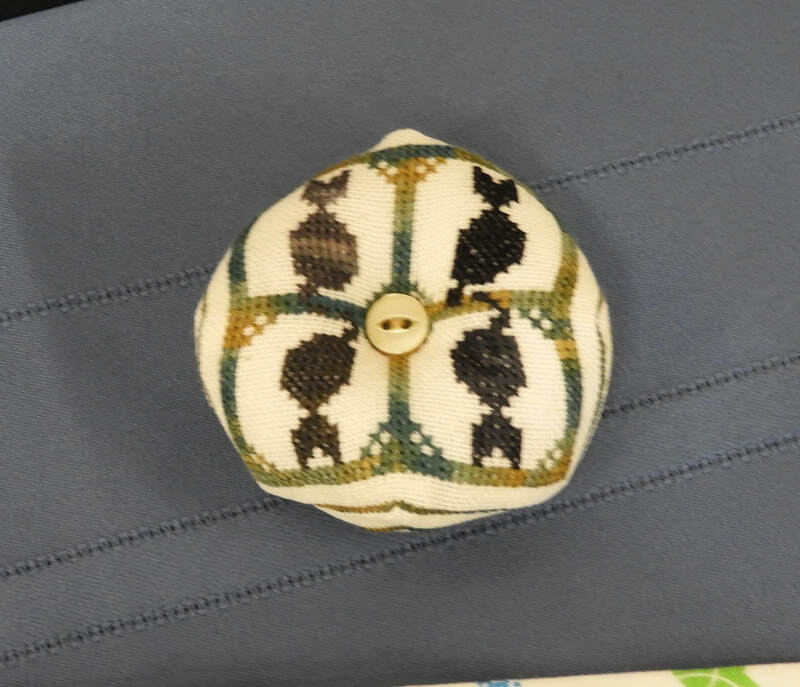 It is 'smalls' - any small or miniaturized items such as needle cases, pin cushions, scissor fobs, etc. Kim posed between our impartial judges, Bernie and Amy. It was a great way to wrap up the year. ​Have a good summer, everyone! 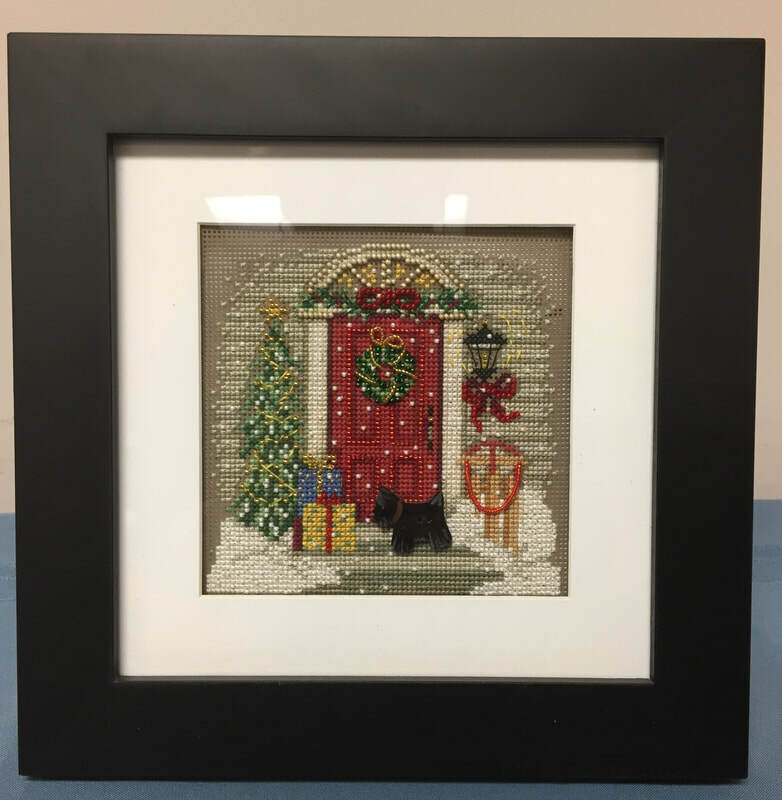 This month, Kim demonstrated the punch needle technique. 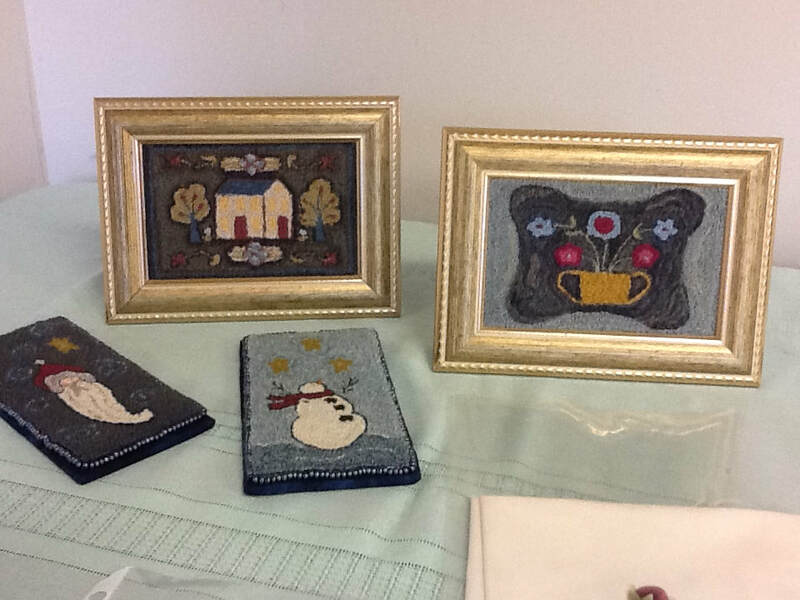 She had several samples of completed pieces. 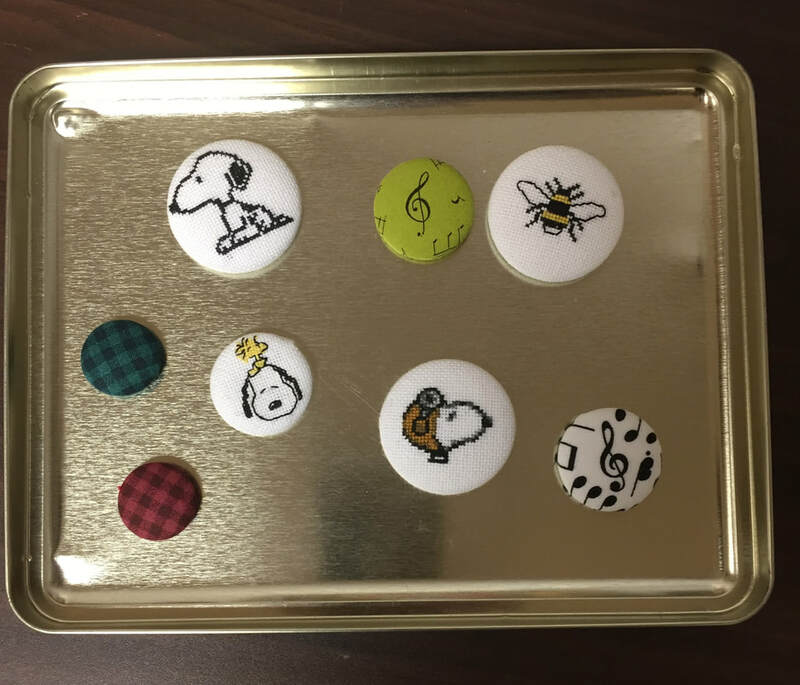 These were pieces Meagan had done as a child. 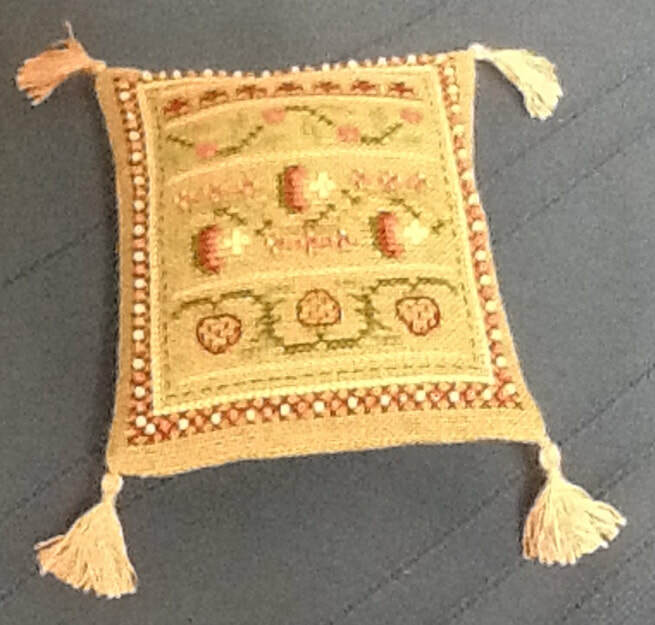 Dianna Thorne will be presenting a class on needle weaving, tonight. In order to optimize learning more about this beautiful technique we ask everyone to arrive promptly and the business meeting will begin sharply at 7:10 pm. Looking forward to a wonderful night! 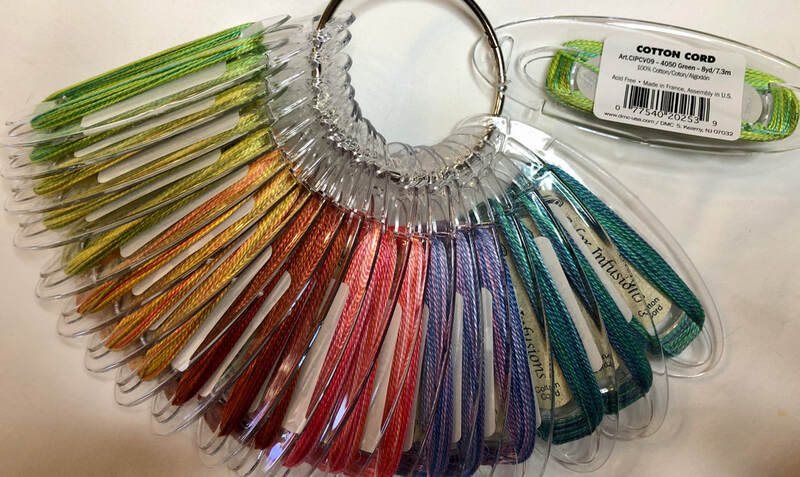 I hope that everyone is signed for this amazing class, and have all your thread colours chosen. What colour way are you choosing? 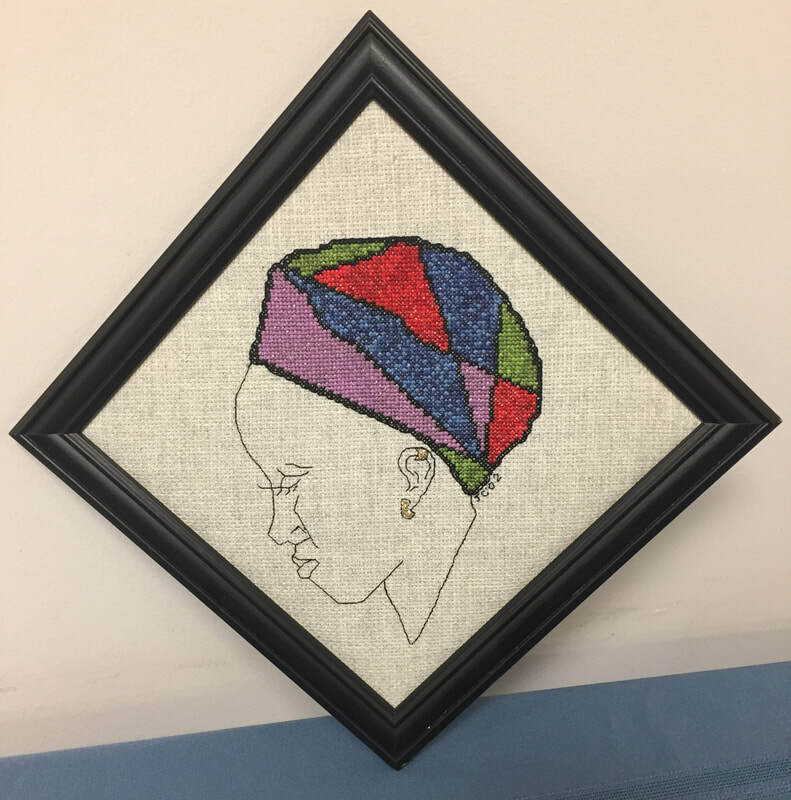 I apologize for the lateness is posting the last segment of Carol's design and her finishing instruction they are up now! 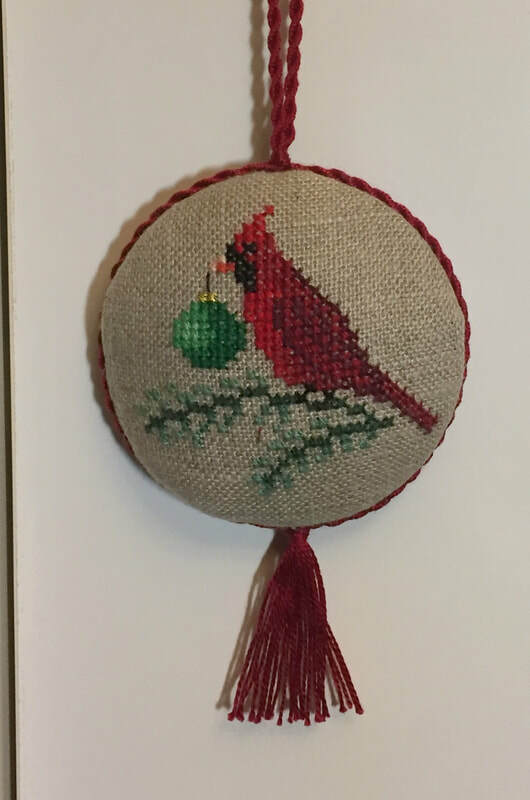 *Please note the direction for the reed stitch is incorrect. It should have seven short stitches. Picture to follow. 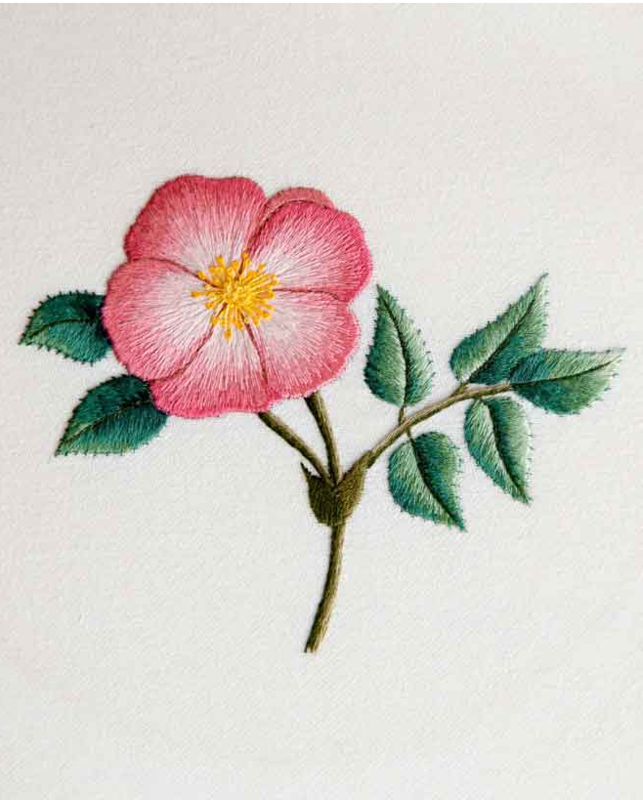 In this weeks handouts there is a misprint for the counted embroidery pattern! Please refer to the chart on the website for the corrected edition. 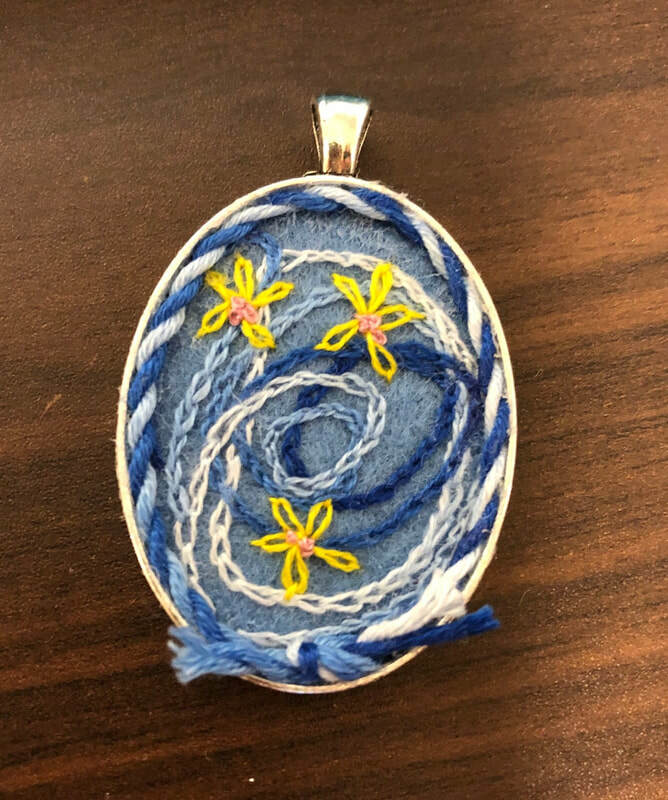 It is amazing to see how everyones' projects are coming along, all are so beautiful and different! This time of year we wish everyone safe journeys on vacation and the drive to and from the meetings. 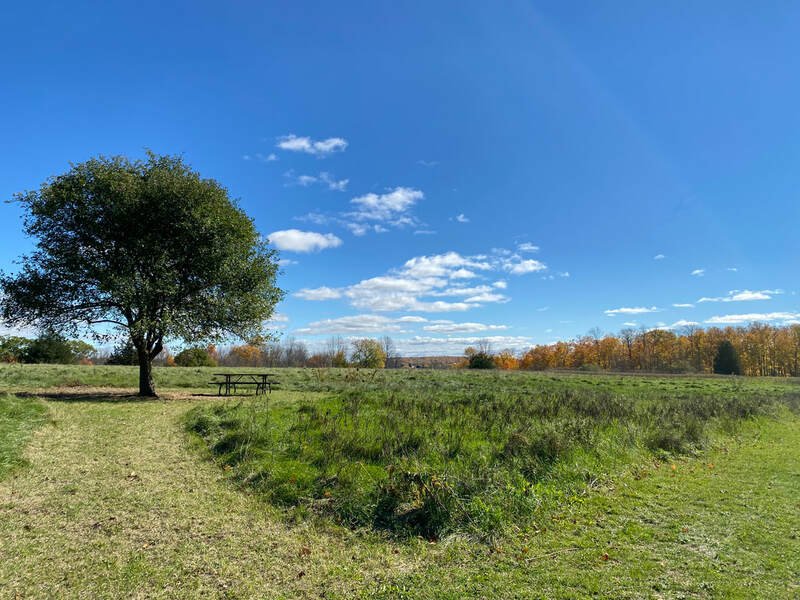 Please check out the project page for the latest updates! 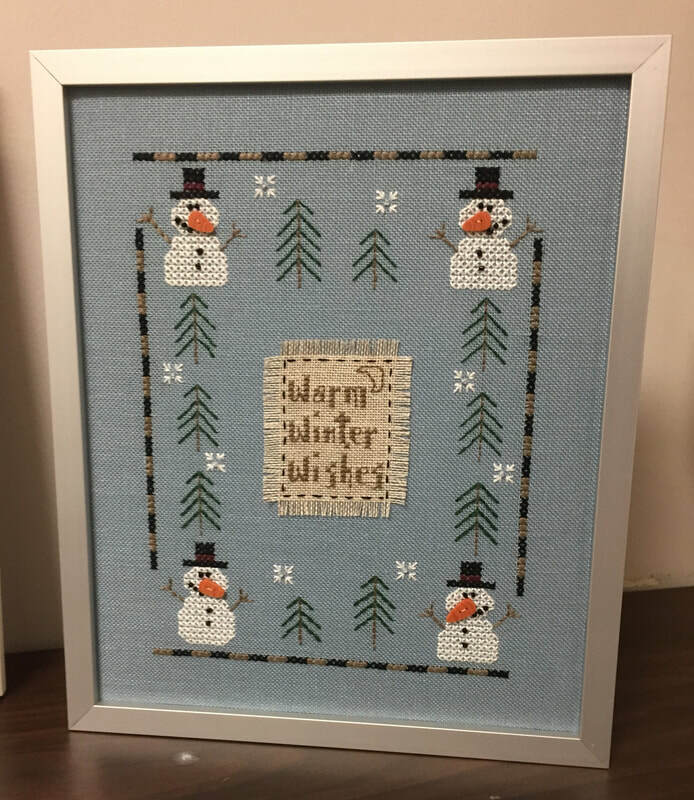 I'm so sorry for the late posting, everything is up now, almost in time for january's pattern. I hope that everyone's project is going well, from what I have seen of they are coming out amazing. Don't worry too much about finishing for January the 18th, it is not a race. 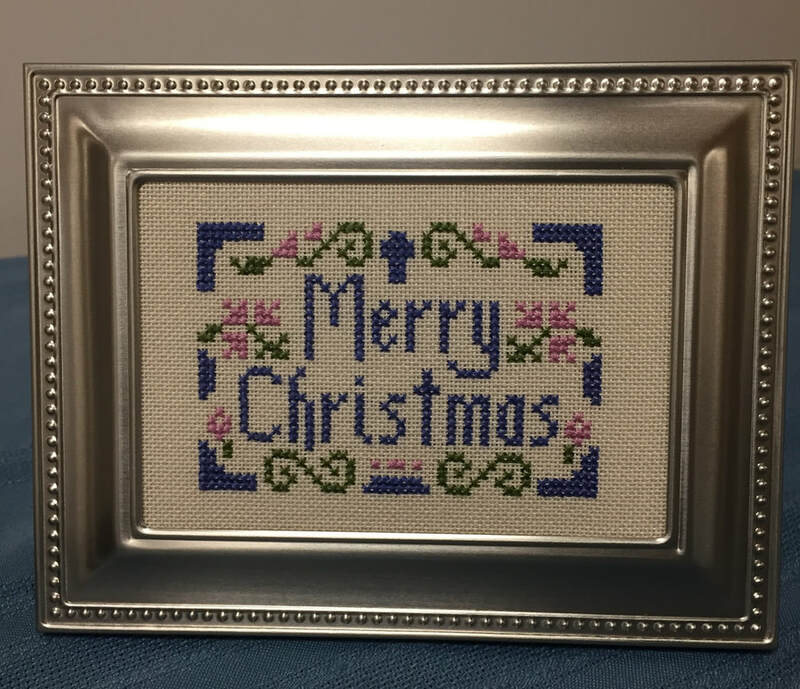 See you all on the 18th for the next pattern in the stitch along! With January around the cornor I'm really late posting the information for the Front Pockect. Hopefully you have begun to work on the project, if not that is okay too (we are in the same boat!). 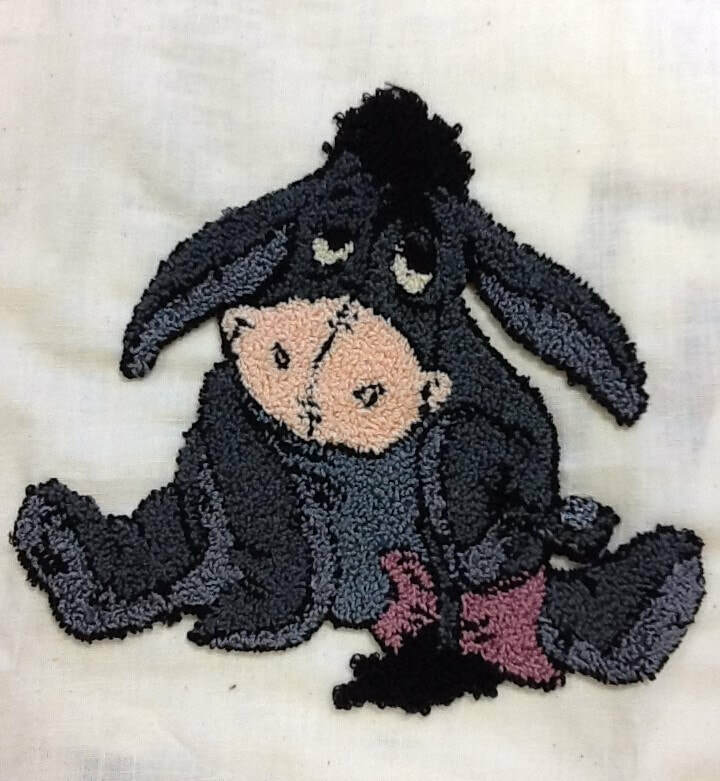 More information on how to stitch Carol's design can be found under "Project"
See you all on the 18th to recieve the next pattern in our stitch along! We have been meeting for over 20 years. 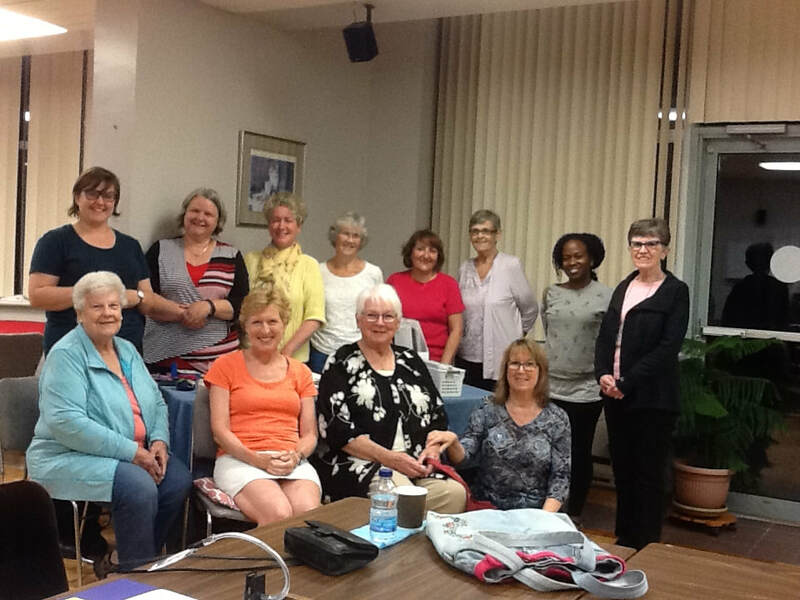 Our members come from all over Durham Region. We welcome new members.